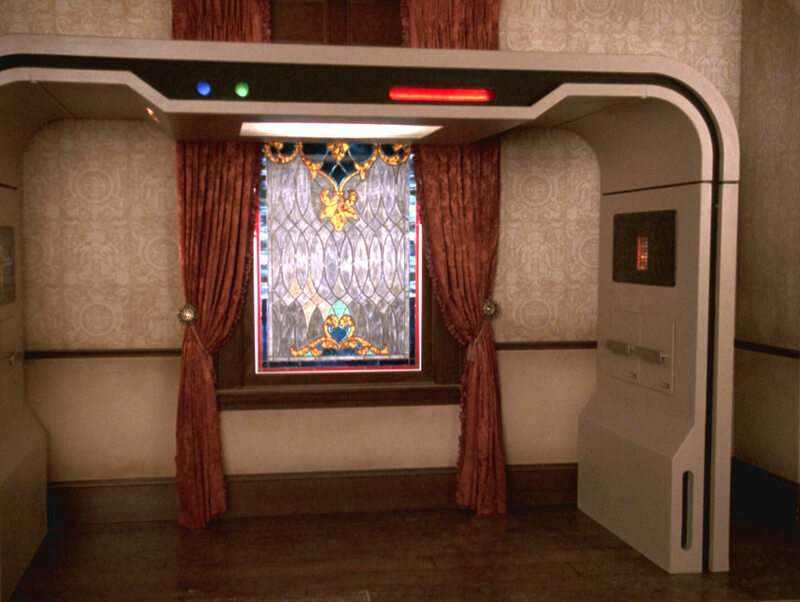 Ex Astris Scientia - Observations in TNG: "Ship in a Bottle"
Here are some observations about sets, props and visual effects in TNG: "Ship in a Bottle" without a specific theme, and a comparison of the original TV release (TNG) with the remastered episode (TNG-R). 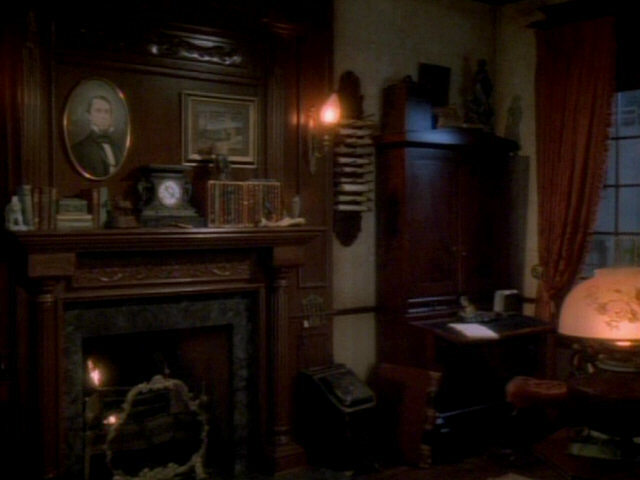 The books on Holmes's mantelpiece in "Elementary, Dear Data" and "Ship in a Bottle". 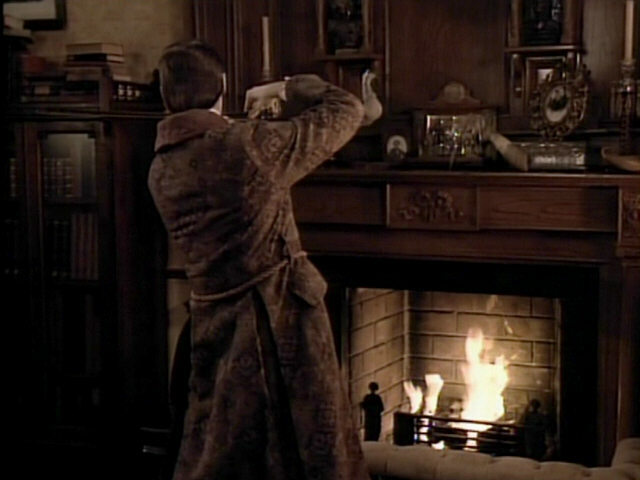 Dear Data" Sherlock Holmes's flat in HD. 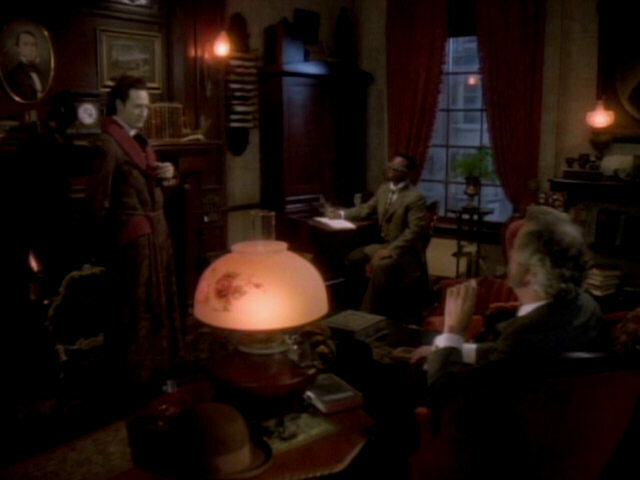 While the general layout of Holmes's flat has remained the same, many details were changed since the set last appeared in "Elementary, Dear Data". 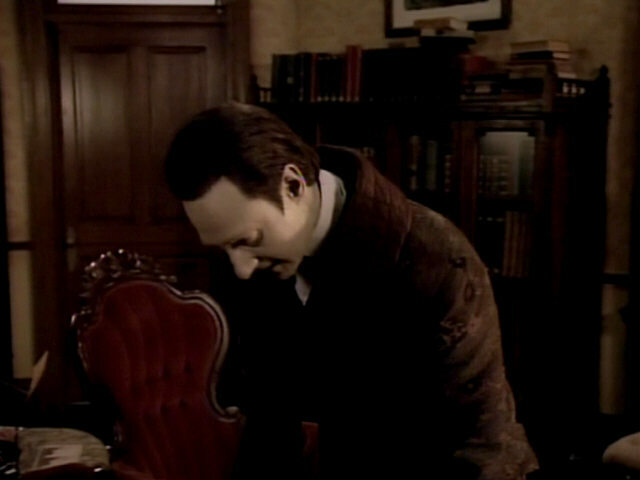 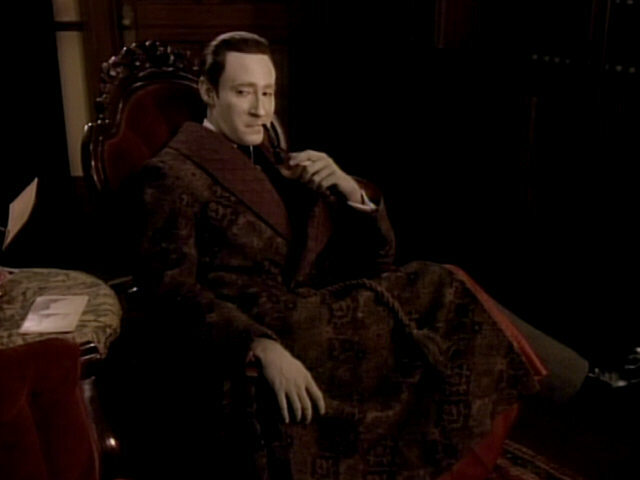 Holmes's chair is the same one as in "Elementary, Dear Data". 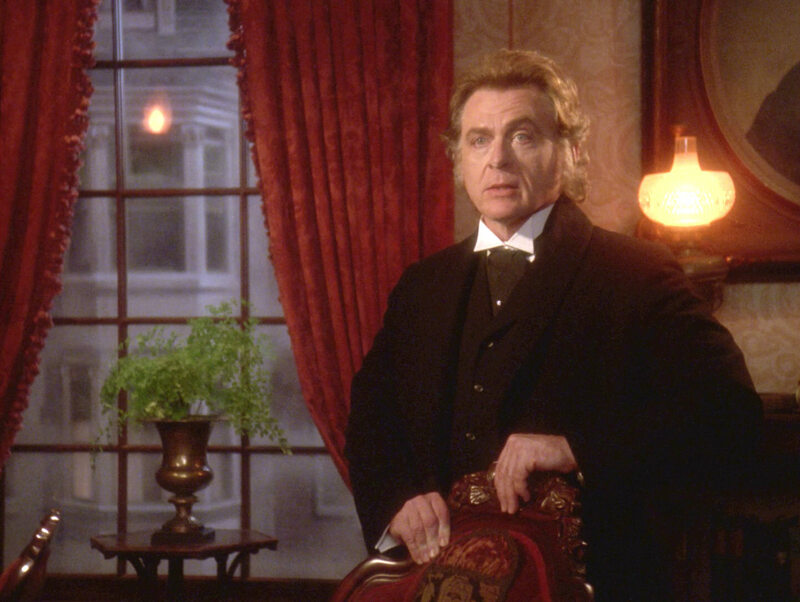 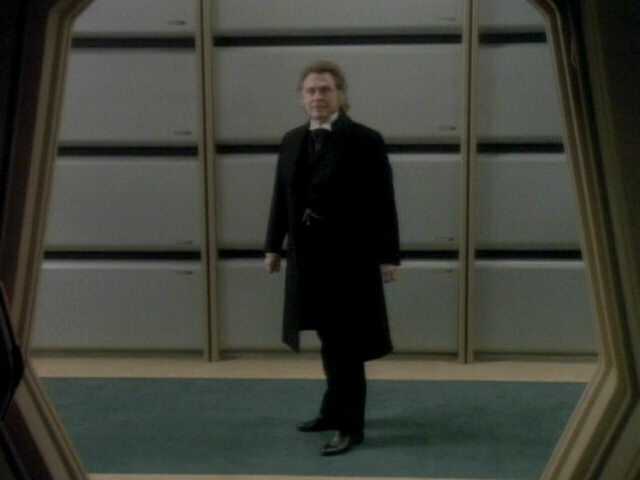 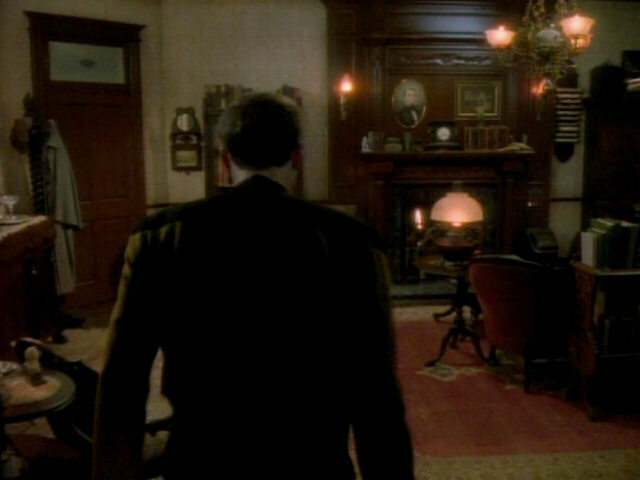 Holmes's flat now features two large portraits that were not part of the set in season 2. 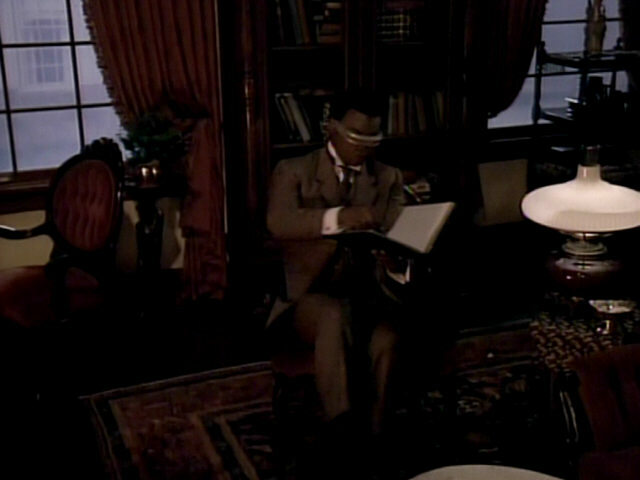 A brief look at Holmes's books. 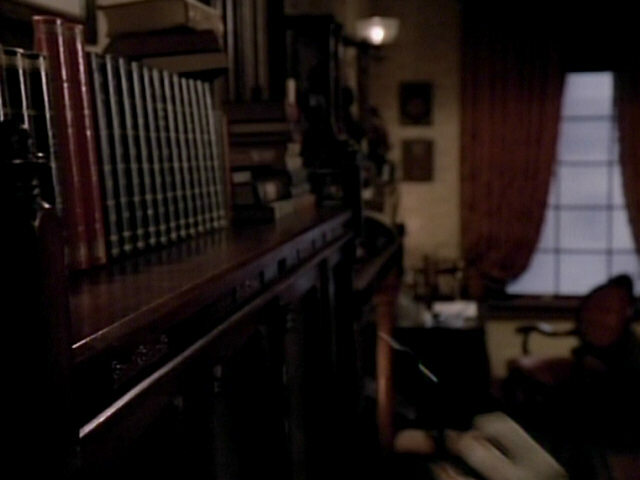 In HD, the title of one of Sherlock Holmes's books can be read: "Omero" - Homer. 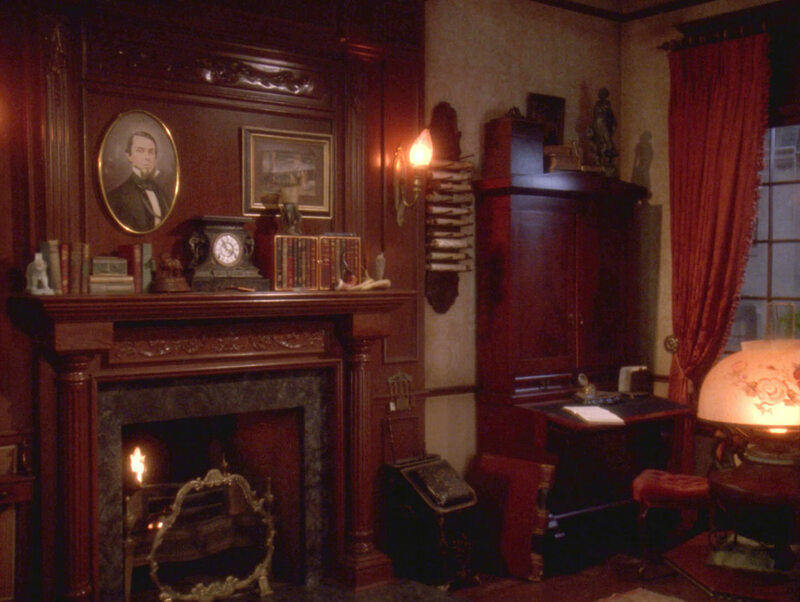 As can be seen in the two screenshots, the fireplace and Watson's desk have changed considerably since "Elementary, Dear Data". 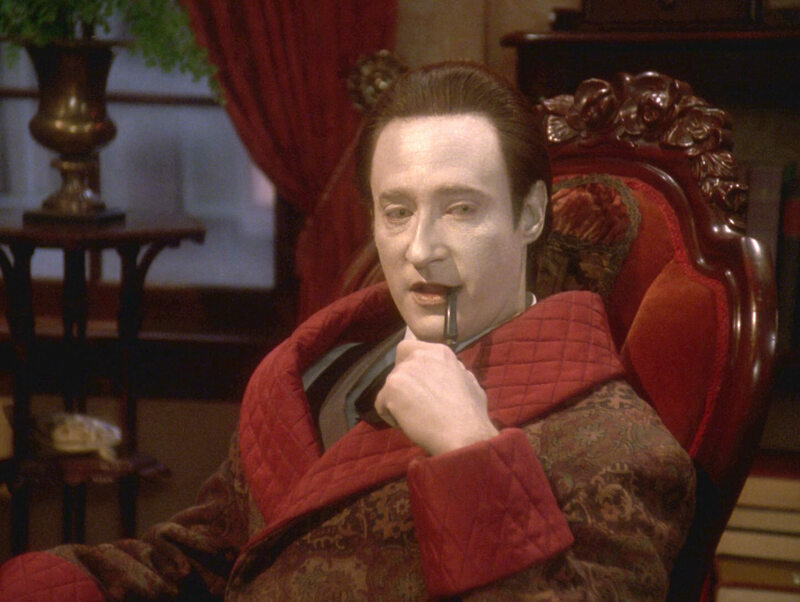 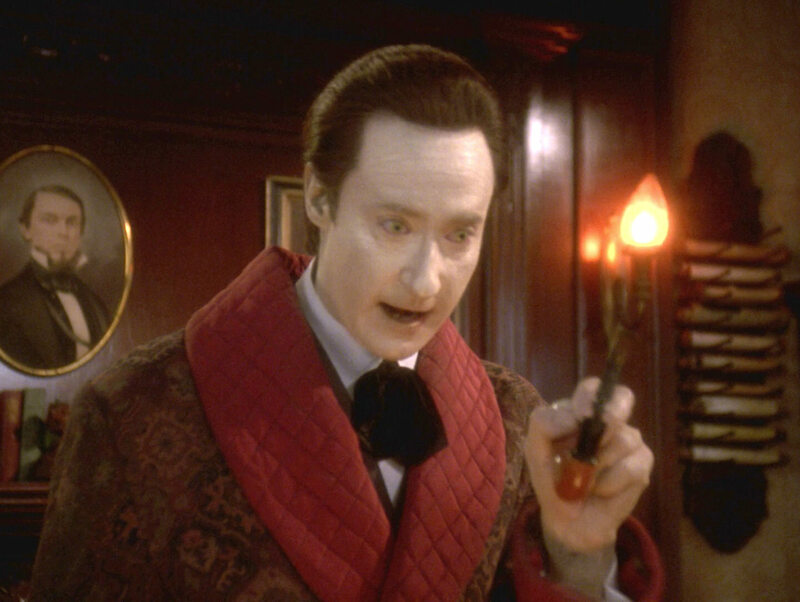 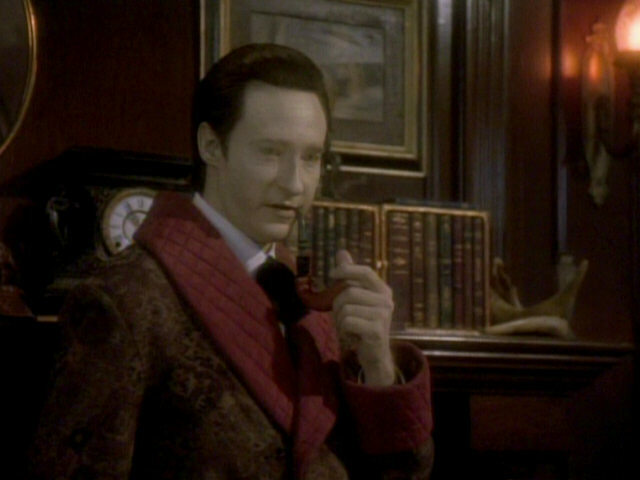 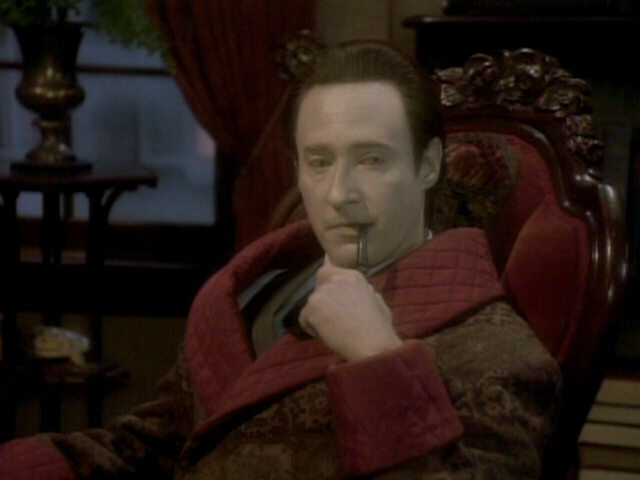 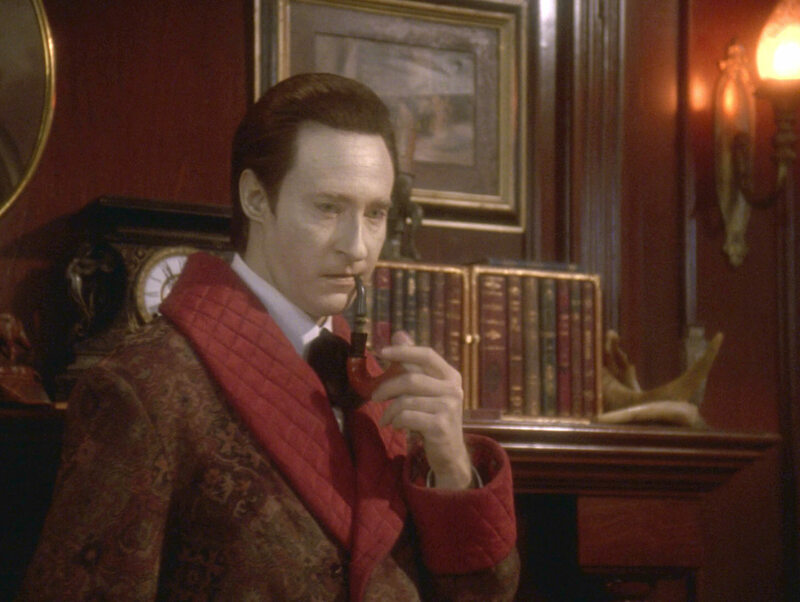 Dear Data" A good look at the fireplace in HD. 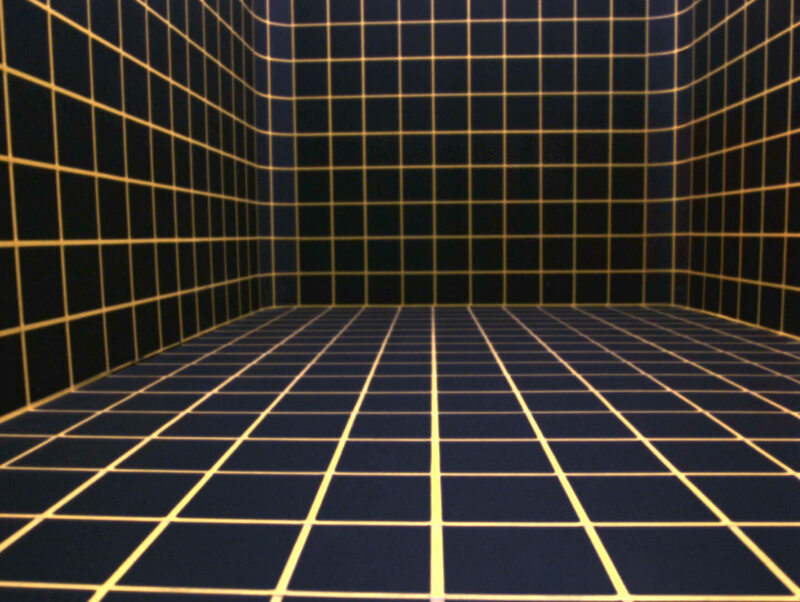 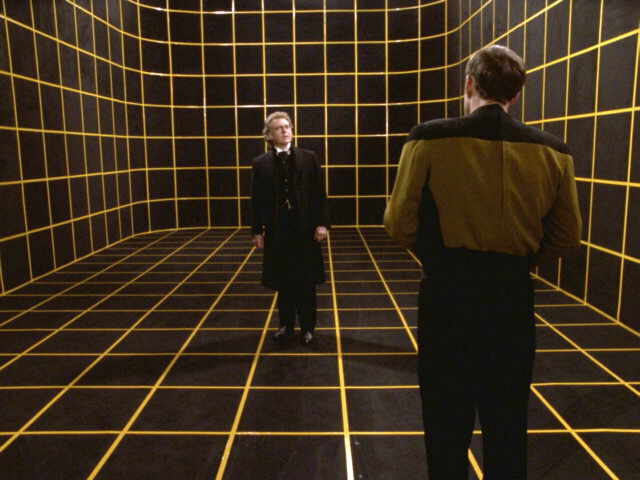 The holodeck grid seems strangely malformed towards the right side of the screen. 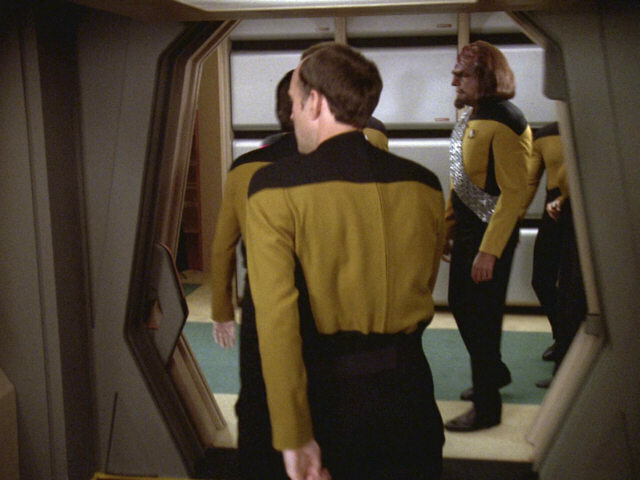 A yellow stripe is also missing in the bottom right-hand corner. 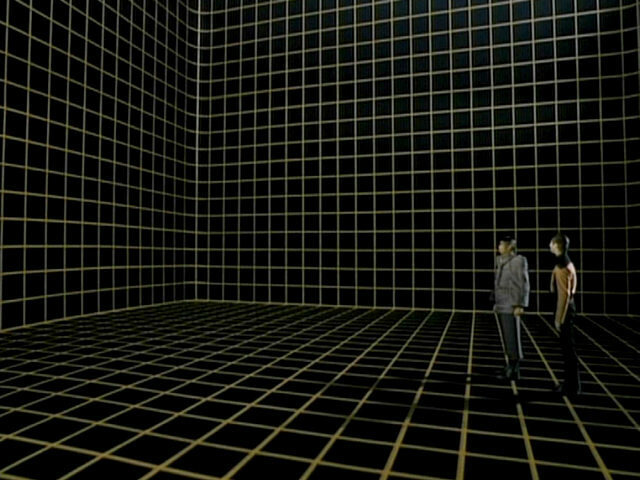 In the remastered version of the episode, the grid looks impeccable. 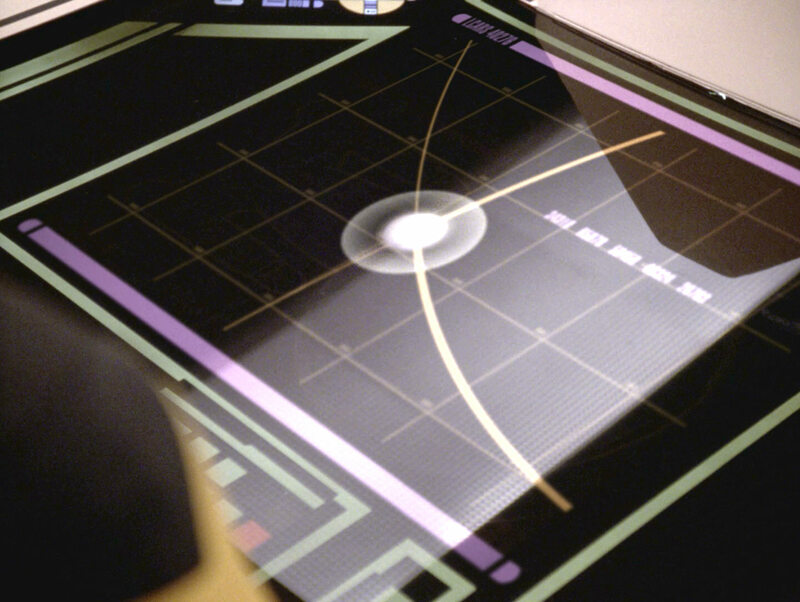 The holodeck arch now features a large LCARS terminal. This terminal was not in place when the arch was last seen, in "Schisms". 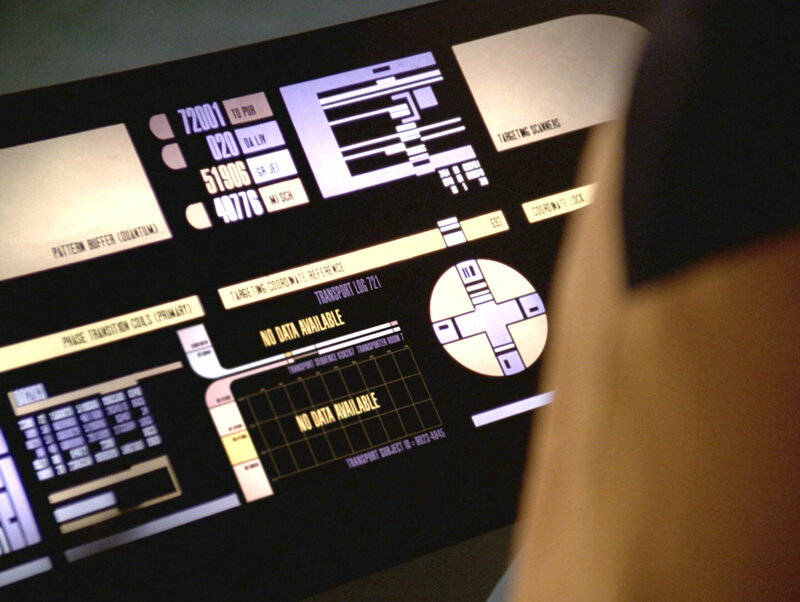 Two removable panels are located below the large LCARS display, in earlier episodes, four more narrow panels were located here. 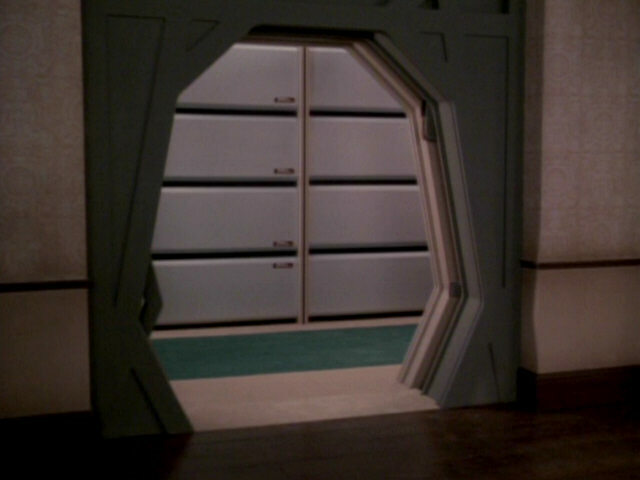 "Schisms" The arch in HD. 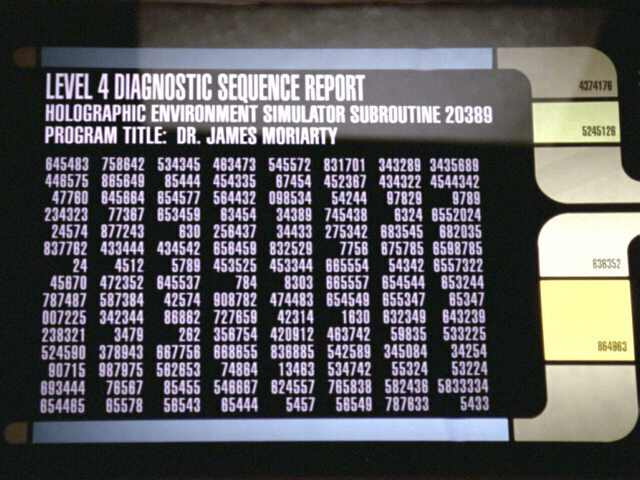 The new large LCARS display was needed for this shot showing the level 4 diagnostic sequence report. 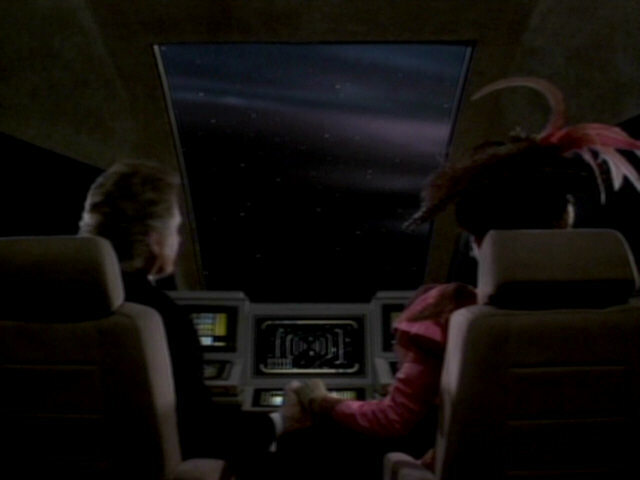 The report was newly created for the remastered version of the episode. 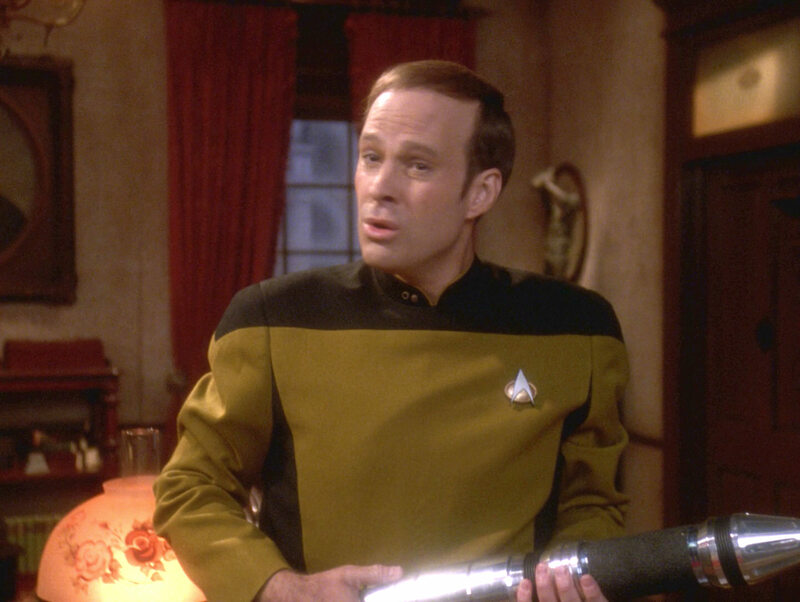 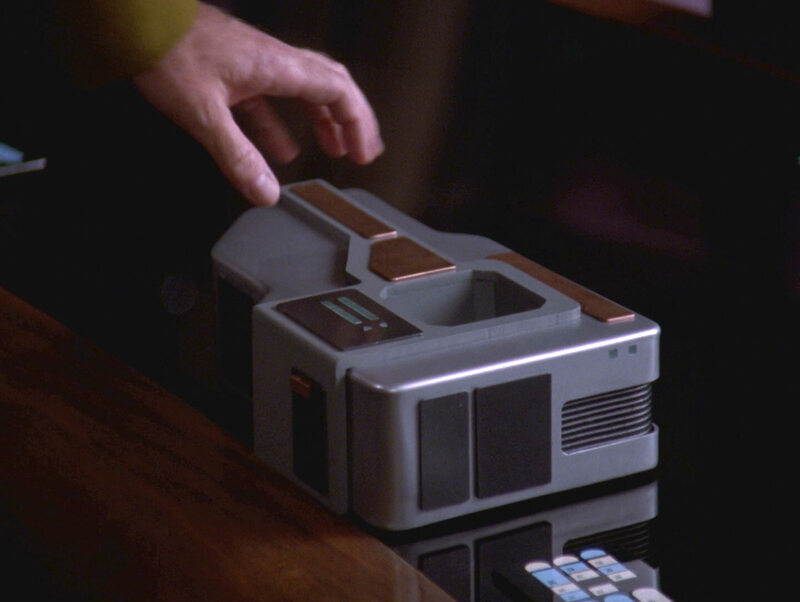 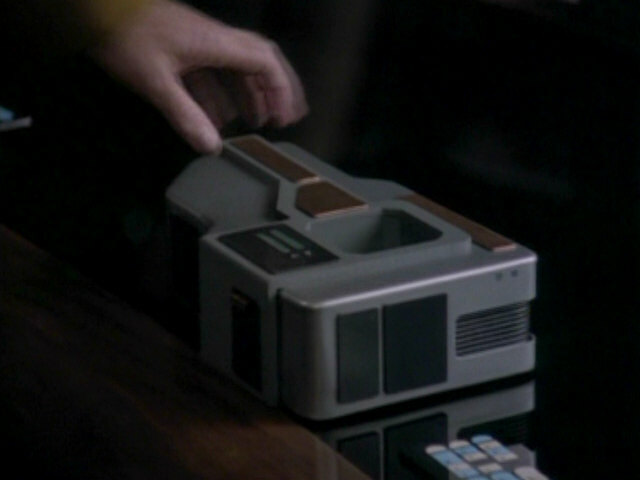 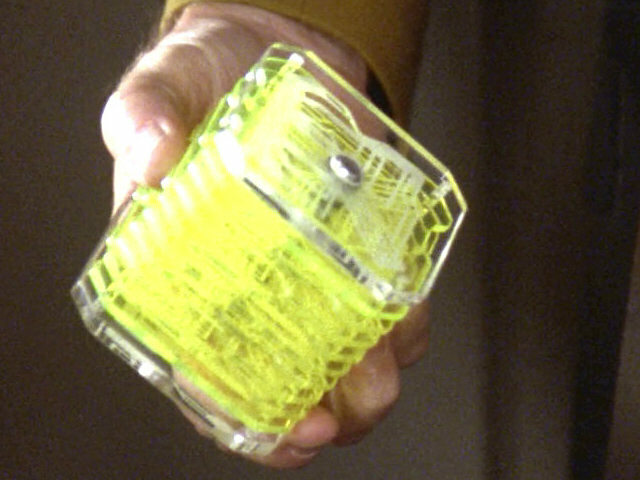 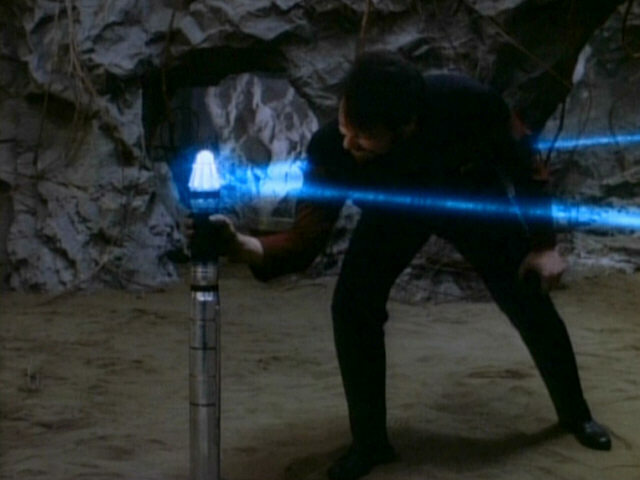 The small device Barclay uses to work on the holographic circuits was originally used by Doctors Crusher and Pulaski as a medical tool in several earlier episodes. 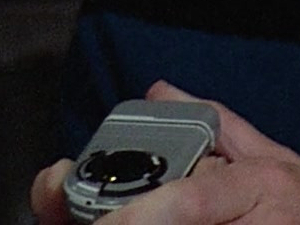 "The Host" A look at the device in HD. 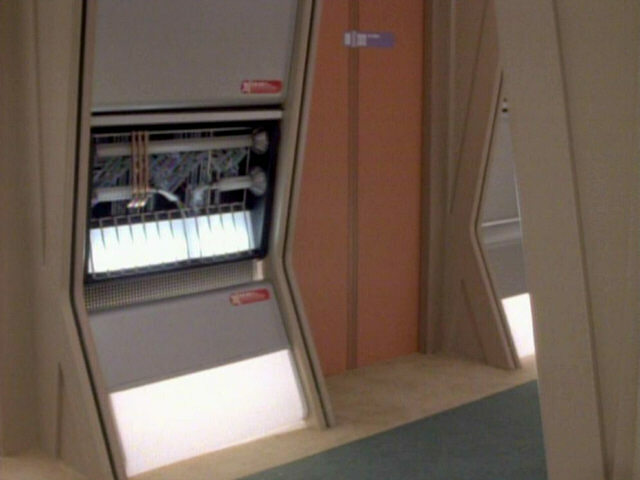 In contrast to holodecks seen in earlier episodes, like "The Defector" and "Hollow Pursuits", this set is rather small and features curved back walls. 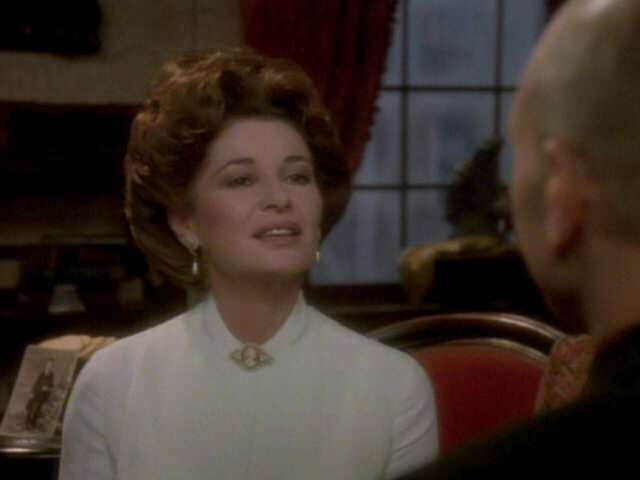 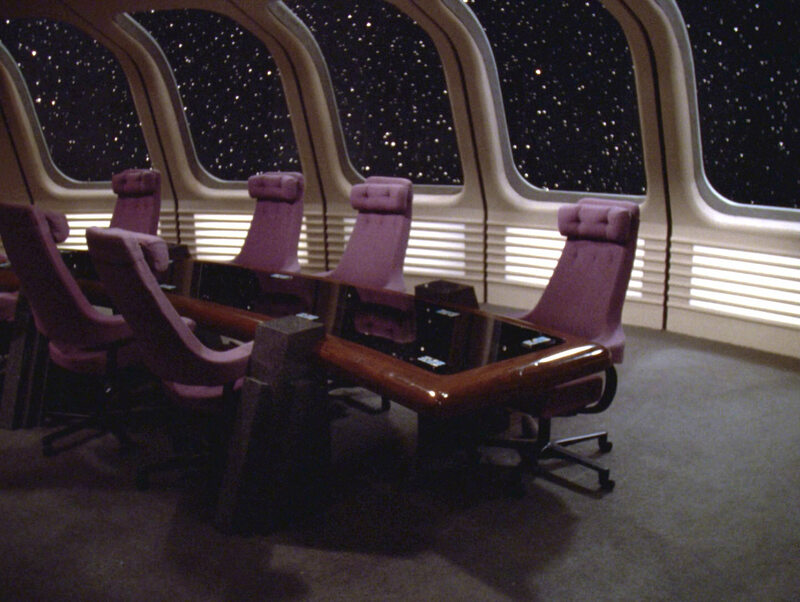 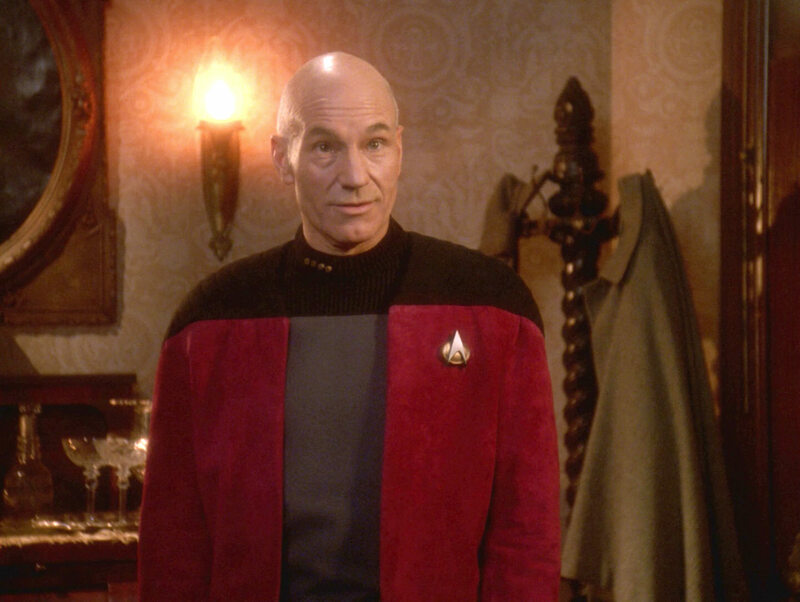 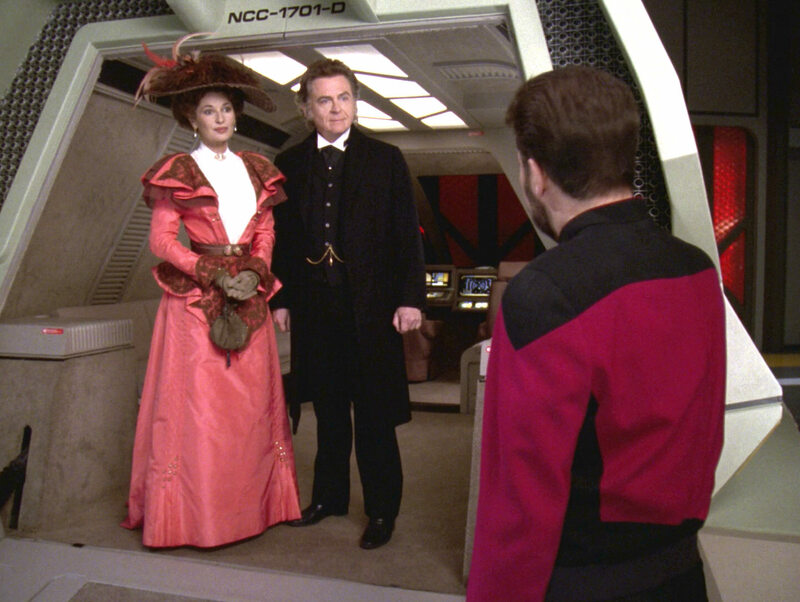 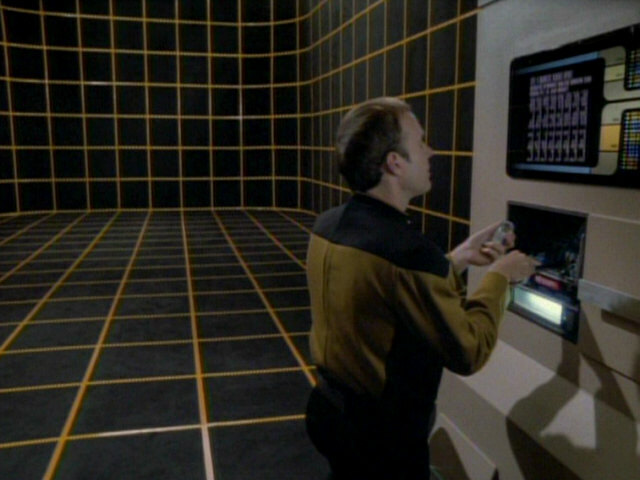 "Hollow Pursuits" The holodeck as it looks in TNG-R. 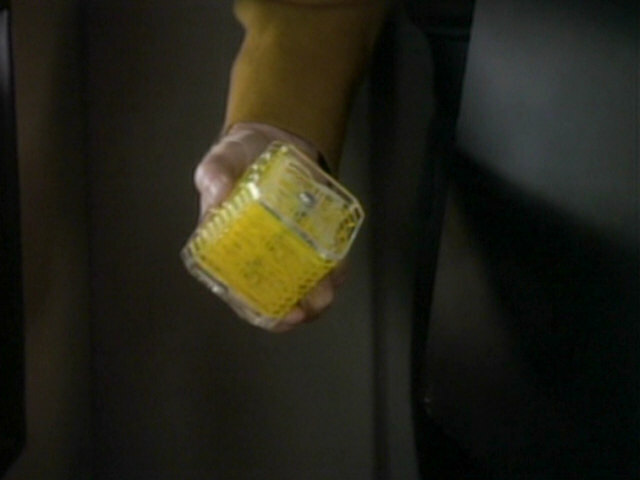 The small black box holding several isolinear optical chips was originally created for "The Mind's Eye". 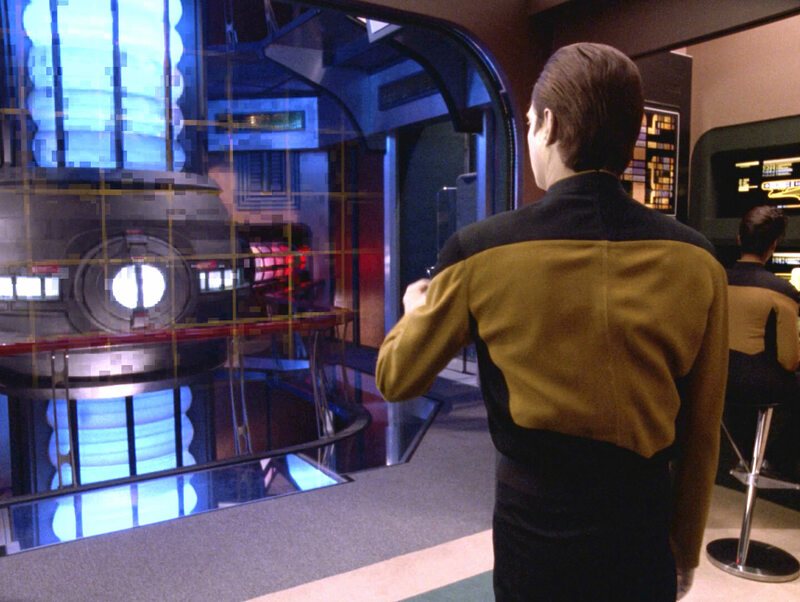 "The Mind's Eye" The circuitry in HD. 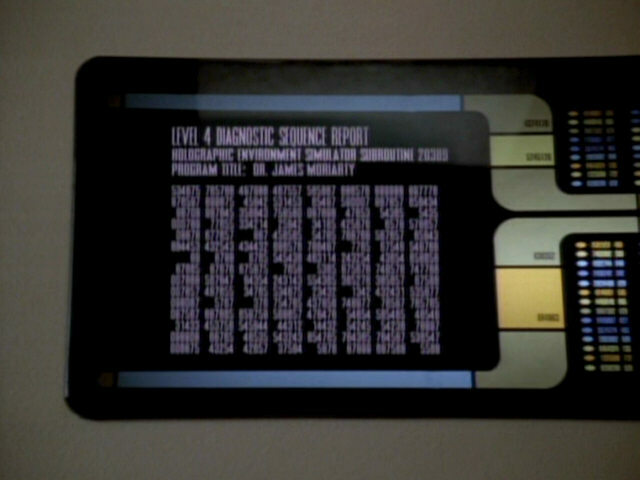 In the original version of the episode, the graphic featured only random strings of numbers, apart from the names of the planets. 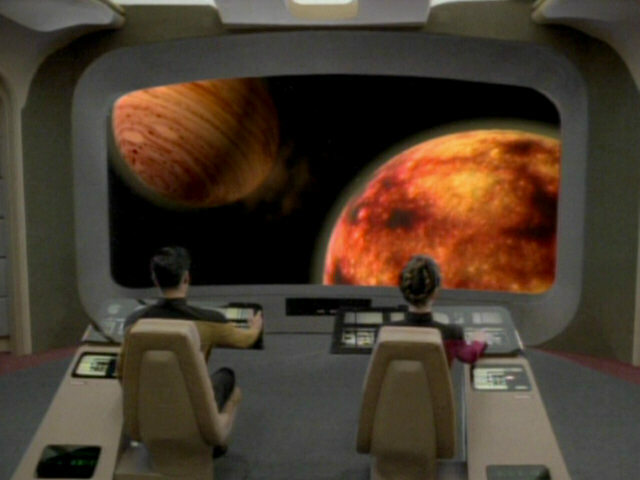 In the remastered version, the recreated graphic features the approximate masses of the planets and the composition of Deltria VI: 92% hydrogen, 8% helium. 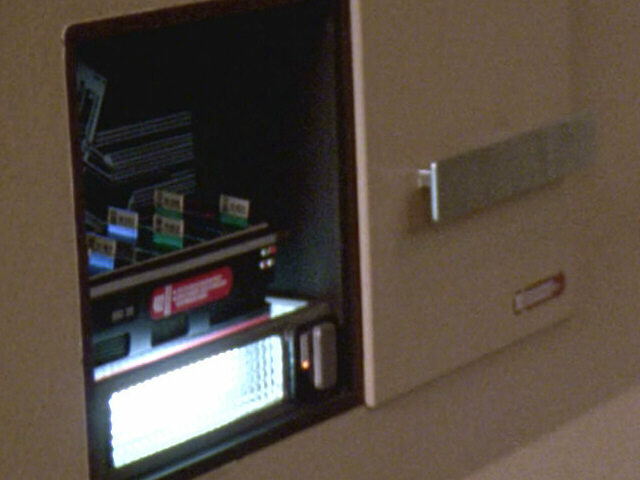 The "40276" in the top left-hand corner reveals that this display was created for season 6. 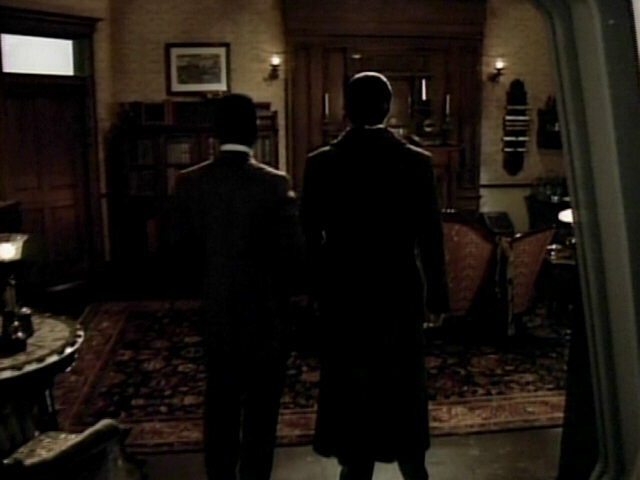 Another good look at Sherlock Holmes's empty flat. 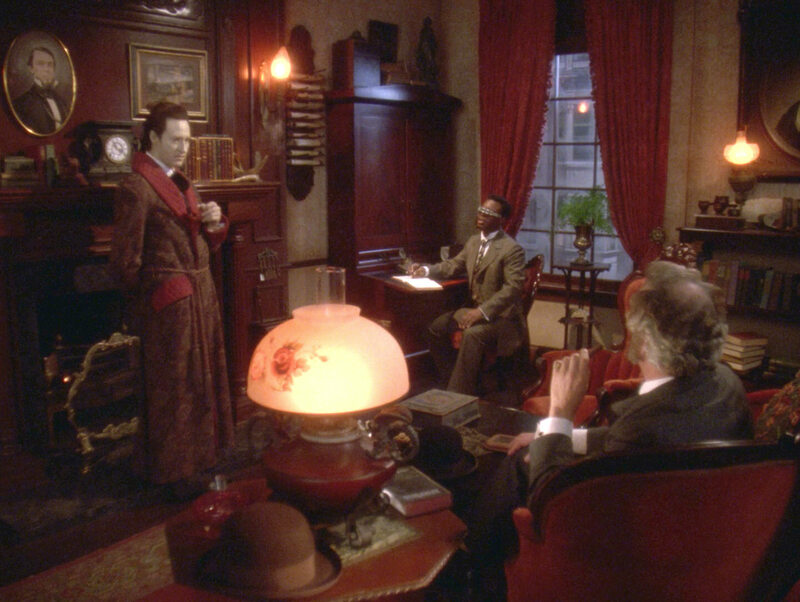 Many details were changed, especially the artifacts on the mantelpiece, as can be seen in the two screenshots. 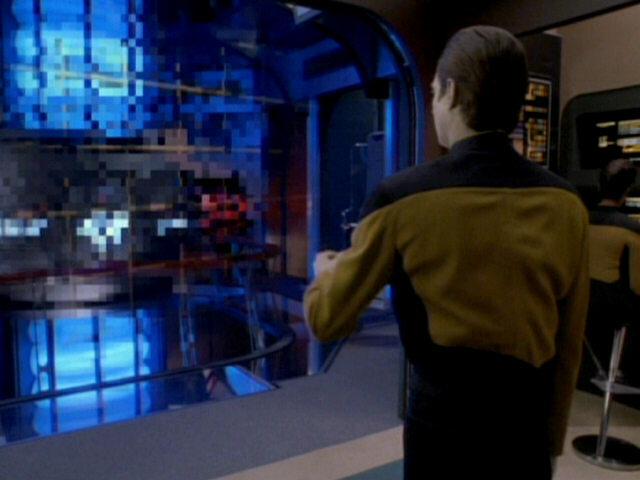 Dear Data" More of the holographic flat in HD. 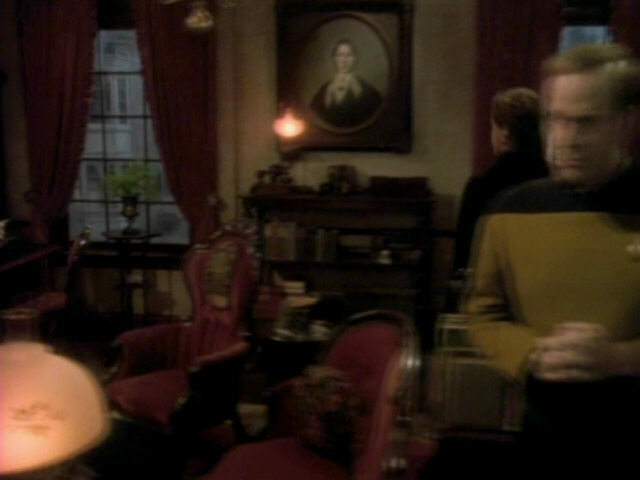 The area between the two windows featured a much higher bookshelf in "Elementary, Dear Data". 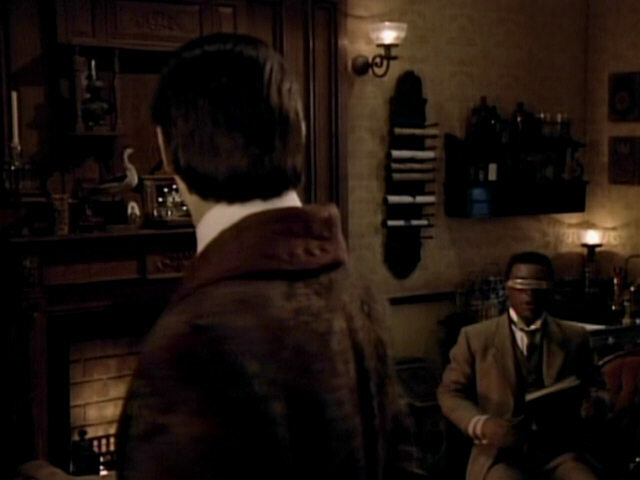 The area to the left of the door as seen in "Elementary, Dear Data" and "Ship in a Bottle". 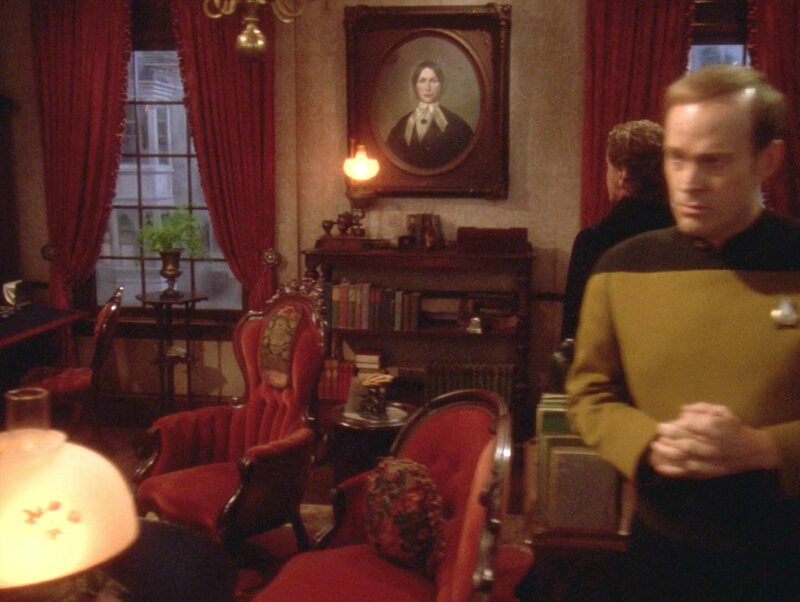 The look out the left window in Holmes's flat, in "Elementary, Dear Data" and "Ship in a Bottle". 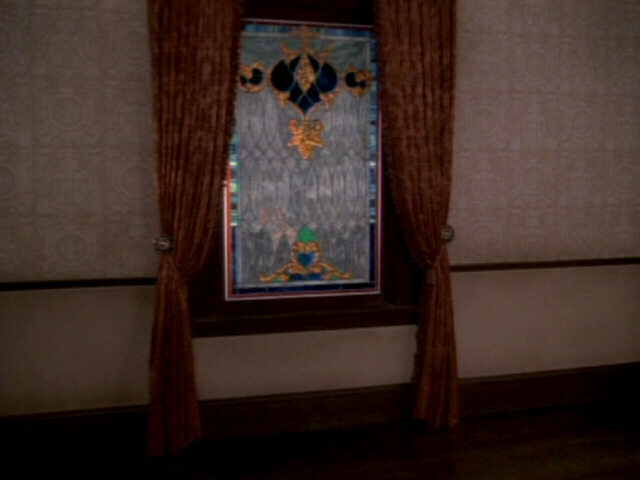 In both cases, the view out the window was extended using a painted backdrop. 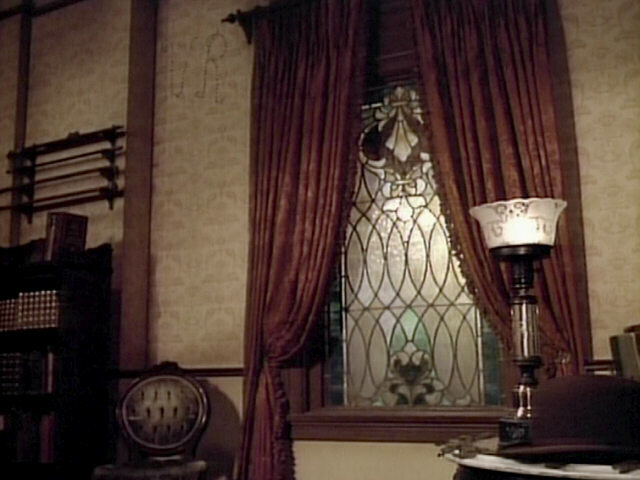 While sharing some similarities, the stained glass window in Holmes's flat looks noticeably different in this second appearance in "Ship in a Bottle". 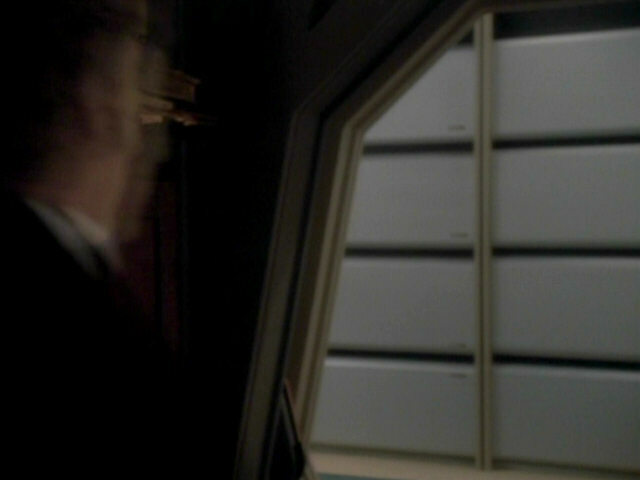 The letters "V R", written in bullet holes, are also missing in this episode. 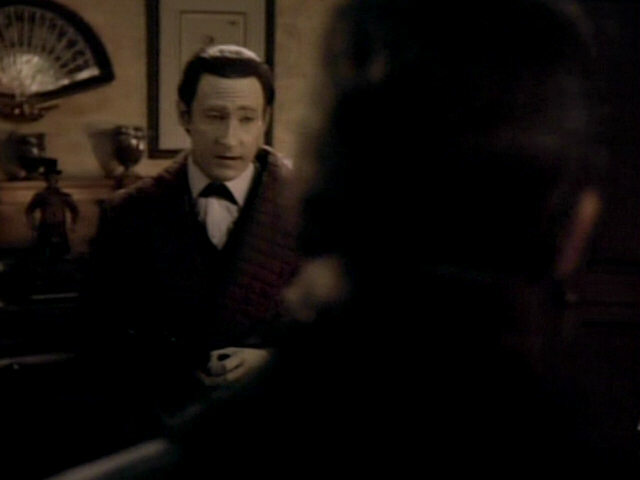 Like in several earlier season 6 episodes, the mirror in Moriarty's guest quarters is covered with a black non-reflective material to hide the reflection of the filming equipment. 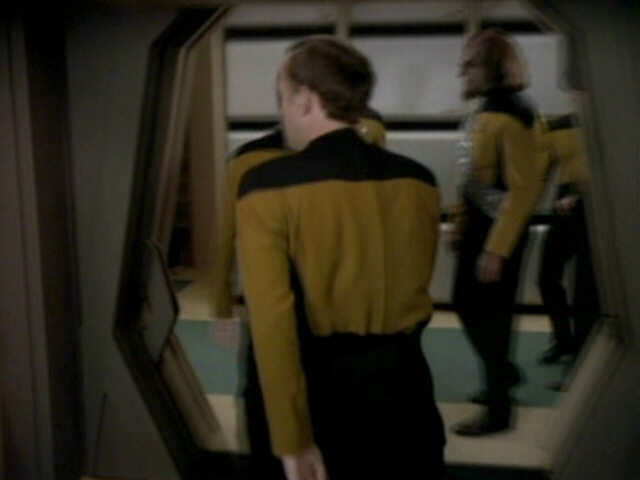 The mirror is covered in the remastered episode as well. 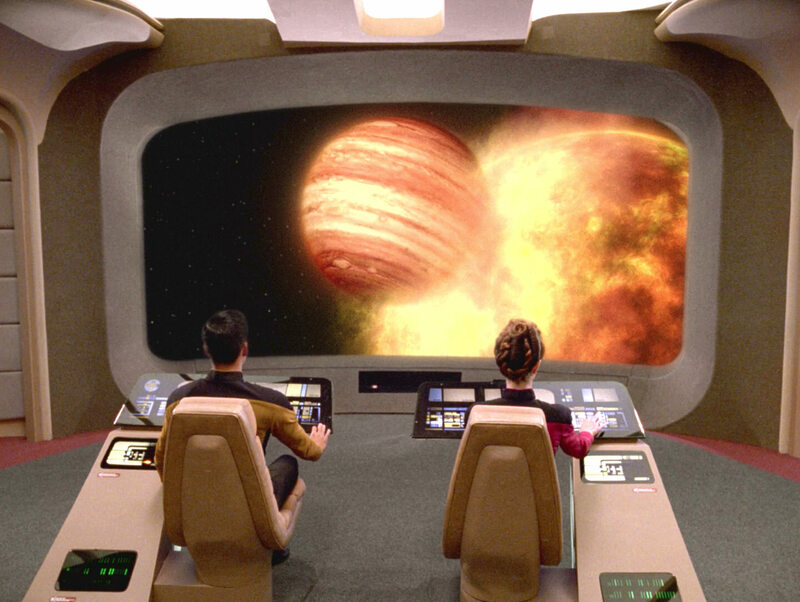 We get a first look at Deltria II and VI on the viewscreen of the USS Enterprise-D. 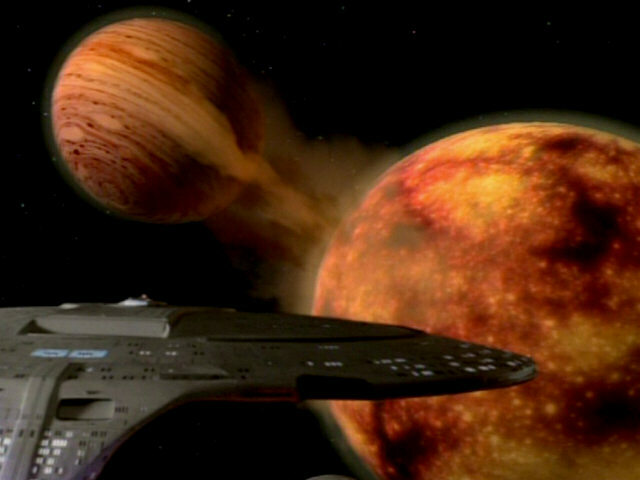 The original planets were already fully created using CGI. 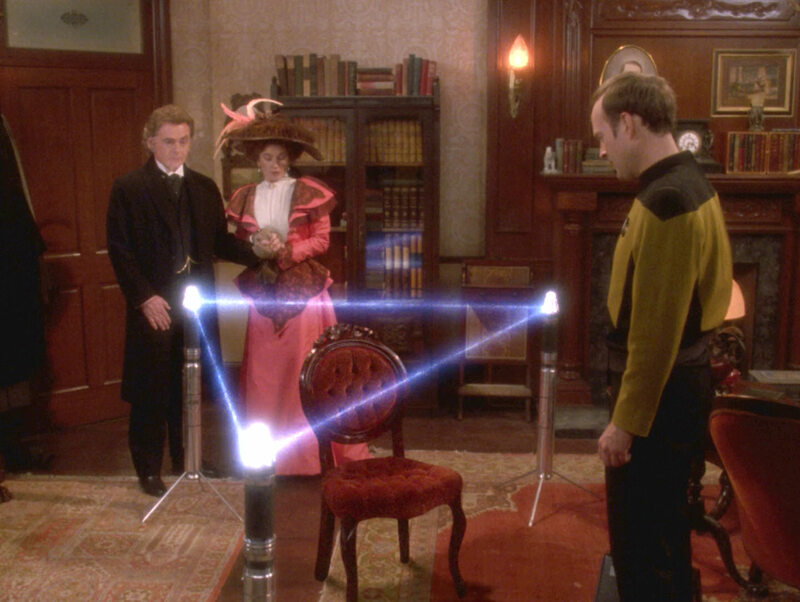 The great shot was redone for TNG-R. 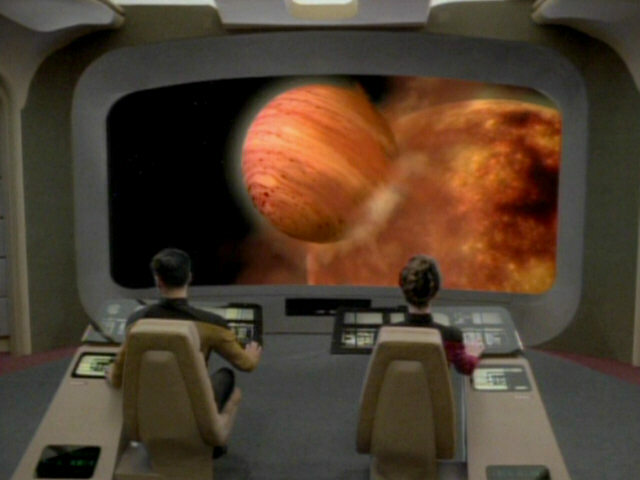 The new gas giant looks more realistic (more like the real planet Jupiter). 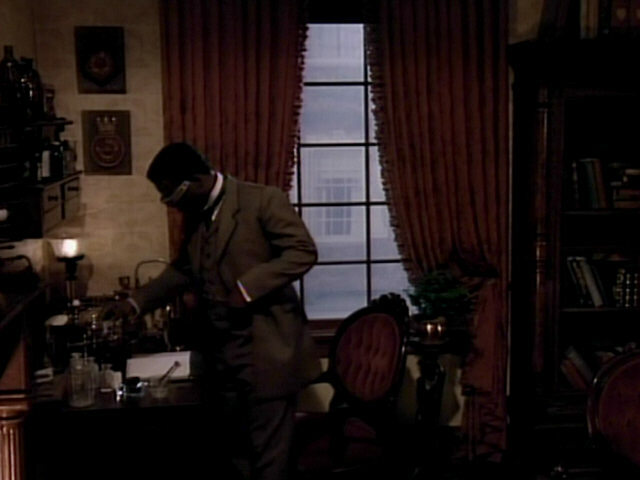 After their debut in "Power Play" and a modified version of the props was seen in "Time's Arrow I", the pattern enhancers return in this episode. 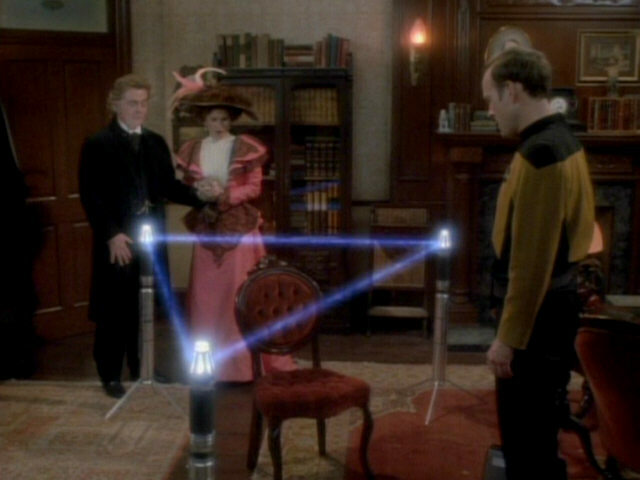 The triangular box in which the three enhancers are carried is also seen again. "Power Play" A better look at the devices in HD. 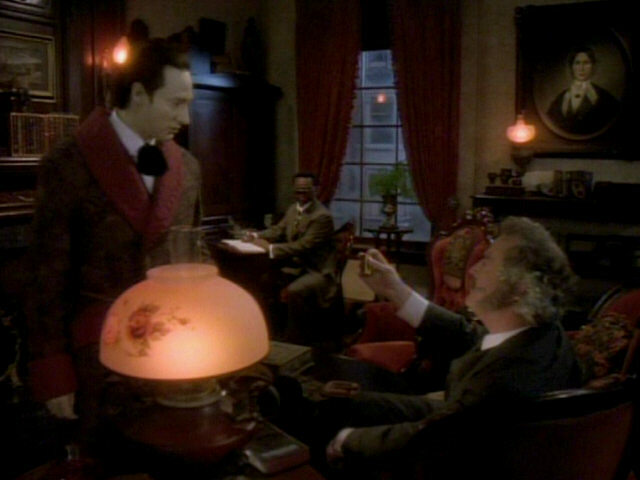 These two shots show the same portion of Holmes's flat in "Elementary, Dear Data" and "Ship in a Bottle". 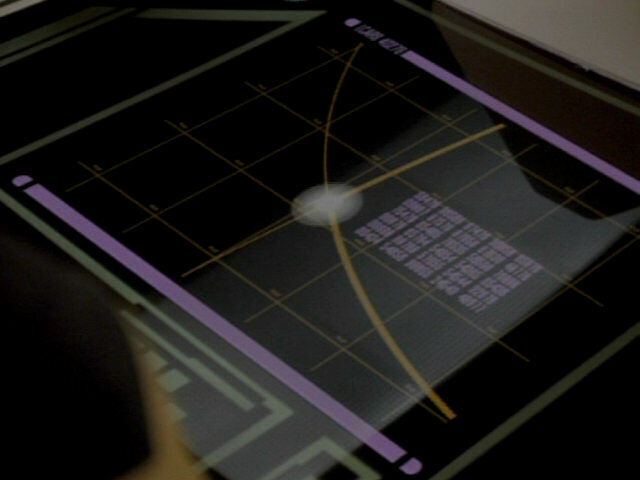 Dear Data" Still more views of the flat in HD. 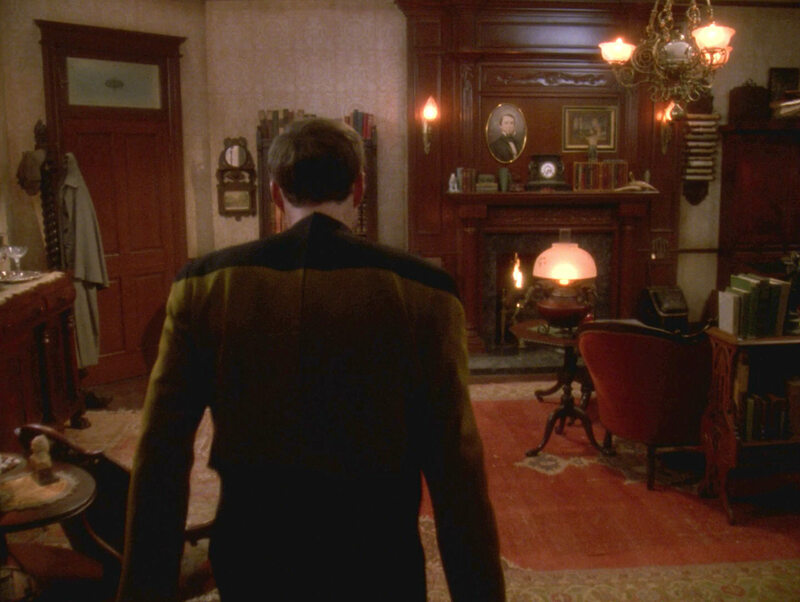 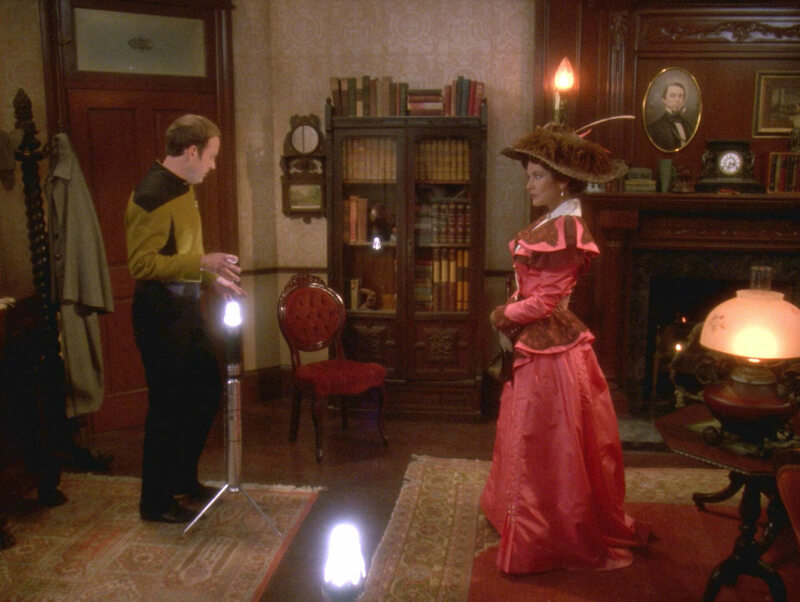 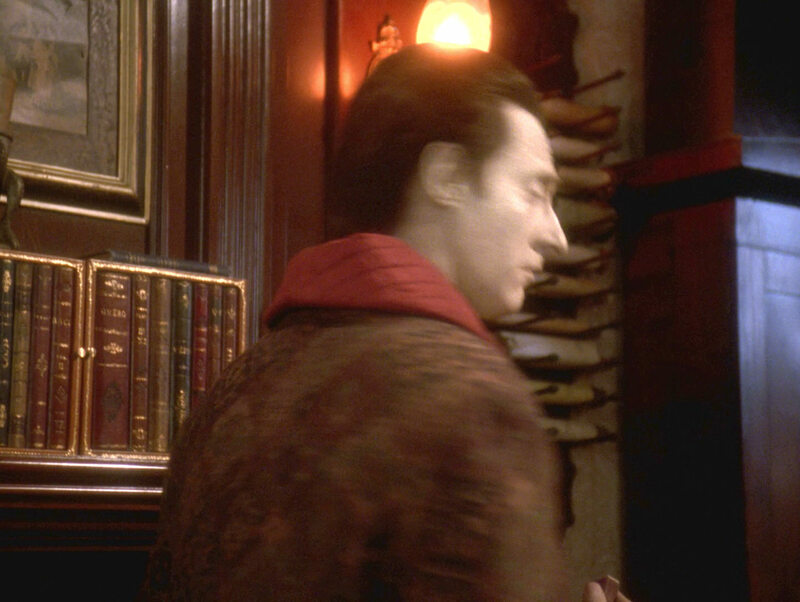 While there were two bookshelves in the area between the door and the fireplace in "Elementary, Dear Data", only one bookshelf appears in "Ship in a Bottle". 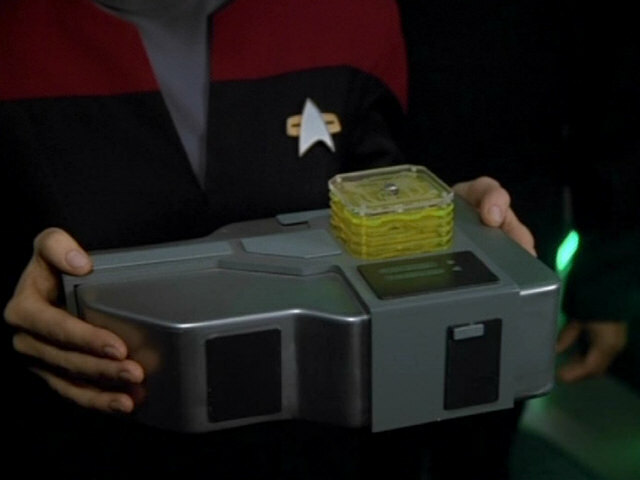 The transport log, displayed on the transporter room console. 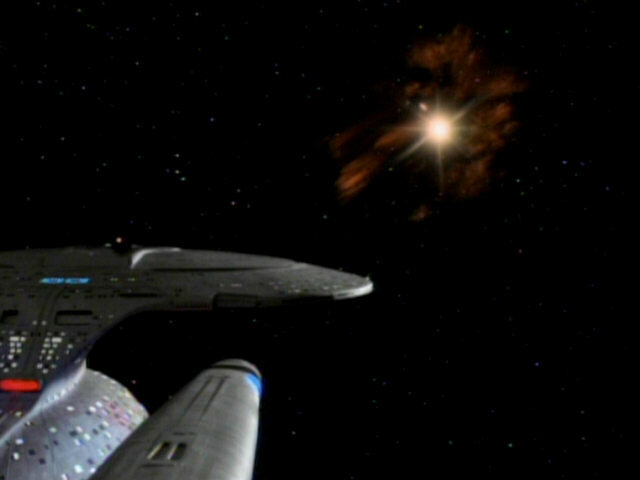 The transport log was faithfully recreated for the remastered version of the episode. 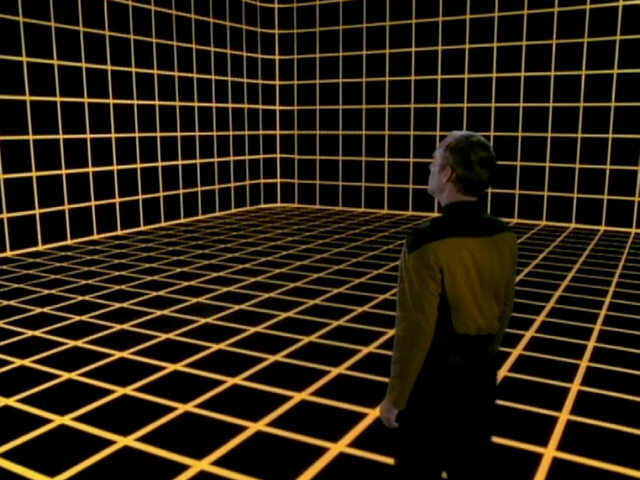 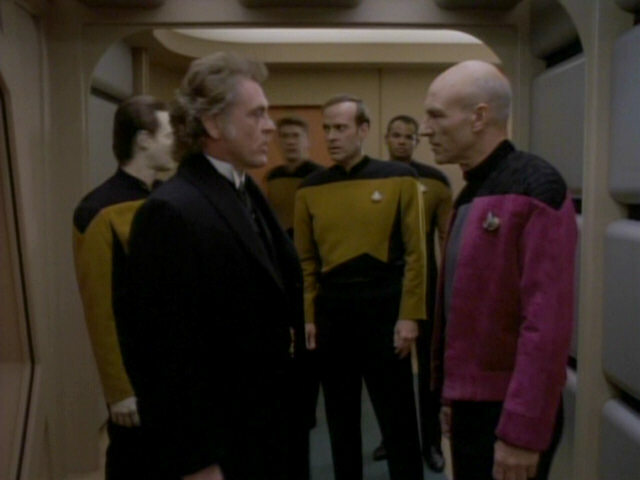 The holodeck grid briefly becomes visible when Data throws his communicator at the warp core. 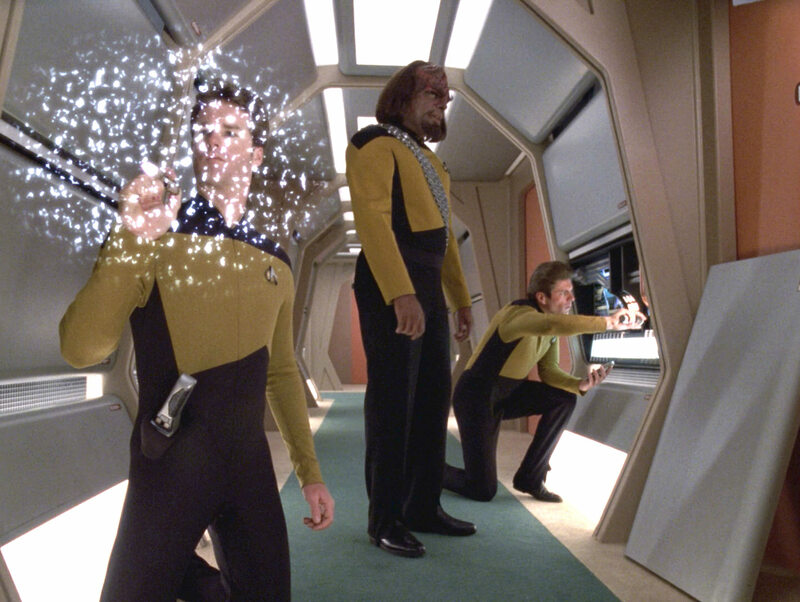 The faithfully reconstructed effect in HD. 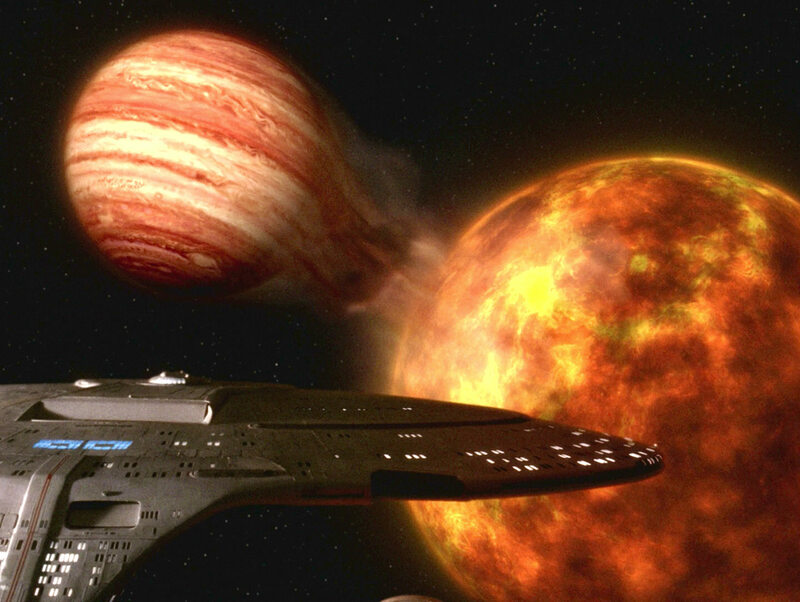 The USS Enterprise-D approaches the two planets in the Deltrian system. 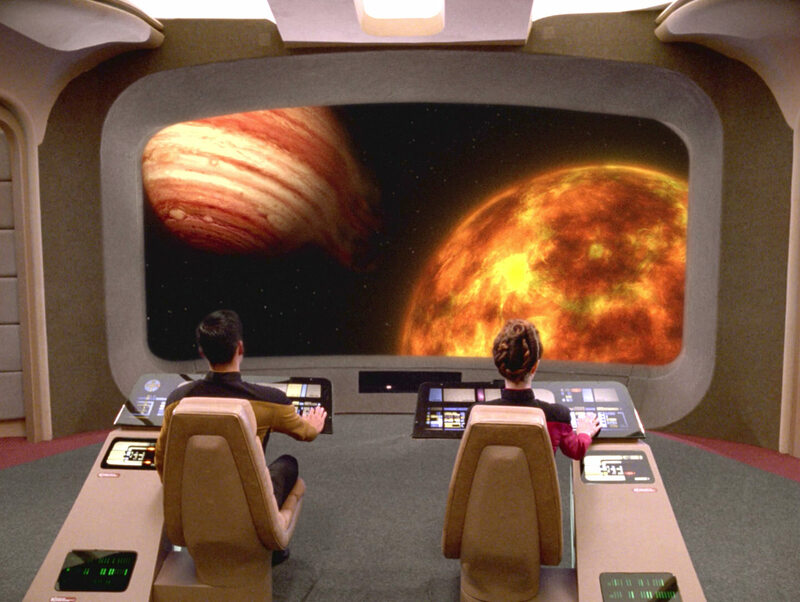 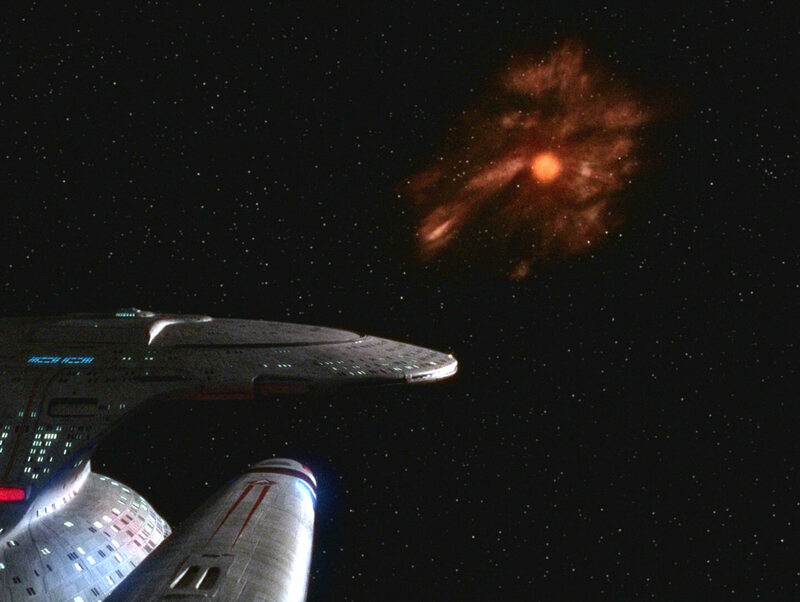 This awesome shot was reconstructed for TNG-R too. 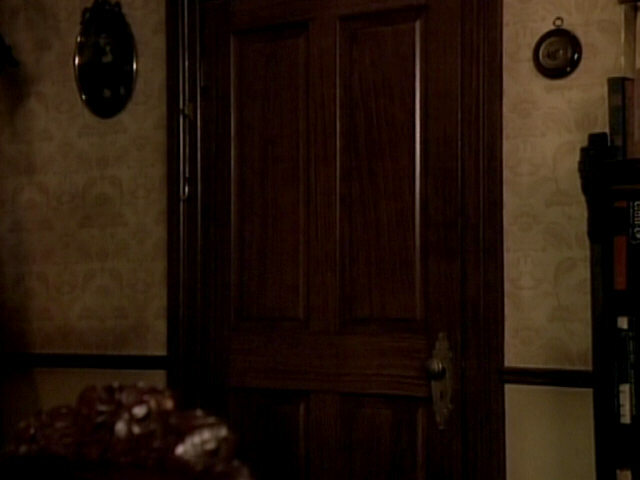 The only shot we get of this part of Sherlock Holmes's flat in "Elementary, Dear Data" is this shot of the door. 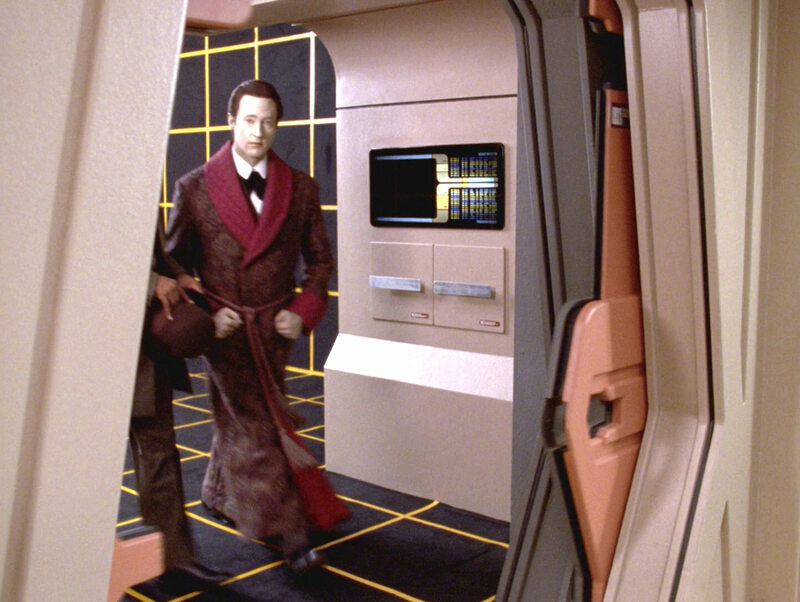 Dear Data" Another look at the set in HD. 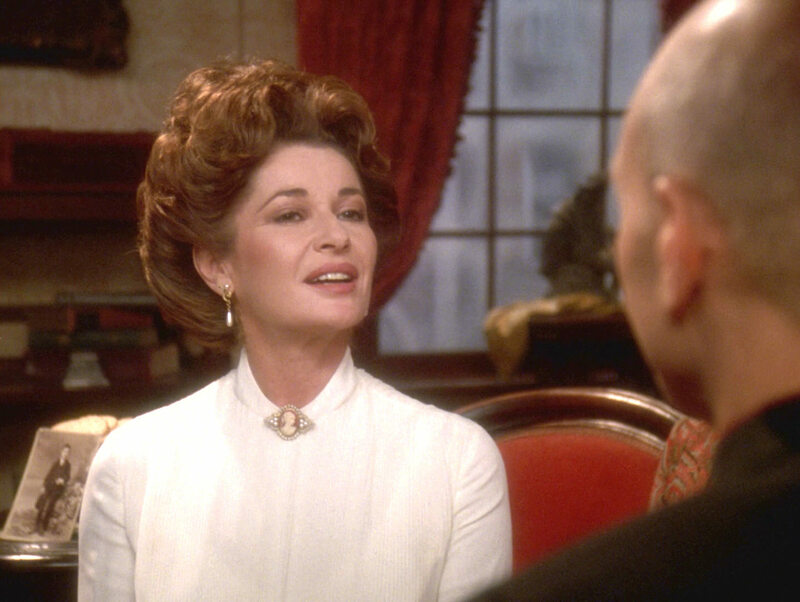 Note the photograph on the small table behind the Countess. 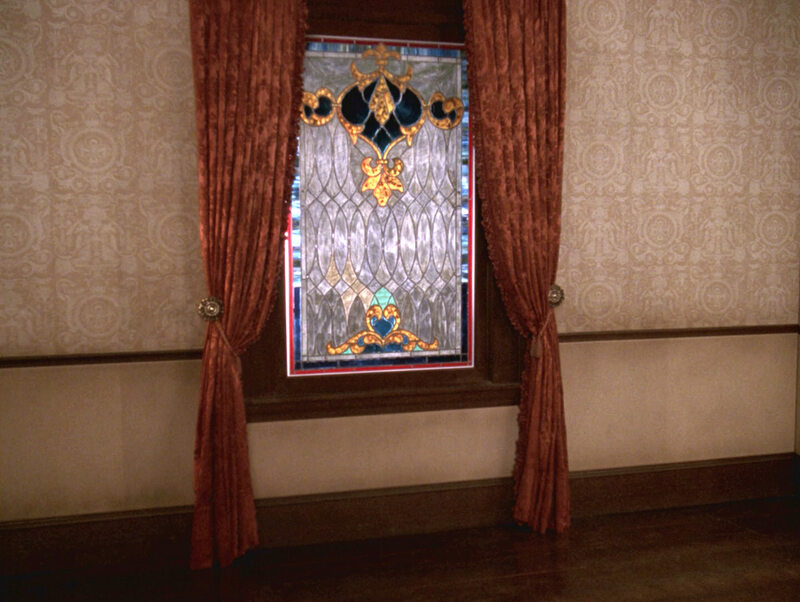 The photograph can be seen much better in HD. 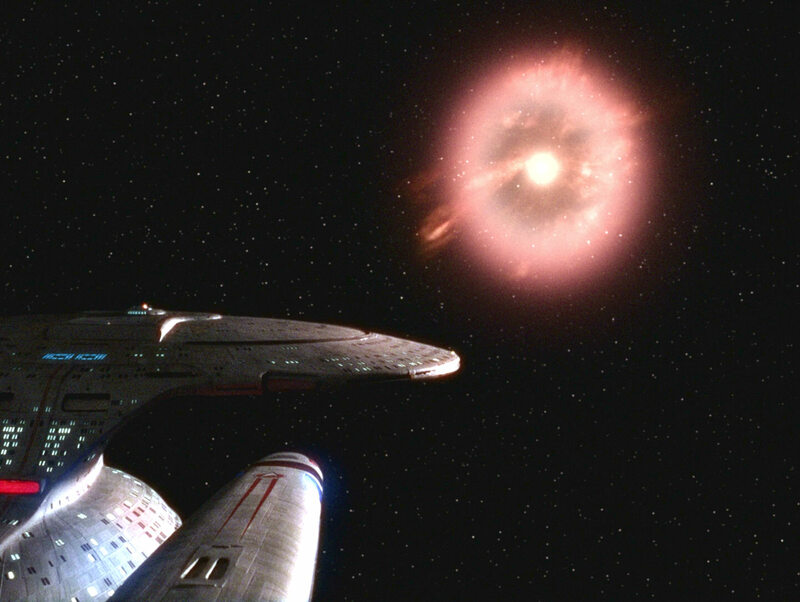 Deltria II and VI begin to merge. The collision zone is much brighter in HD, insinuating an enormous output of energy. 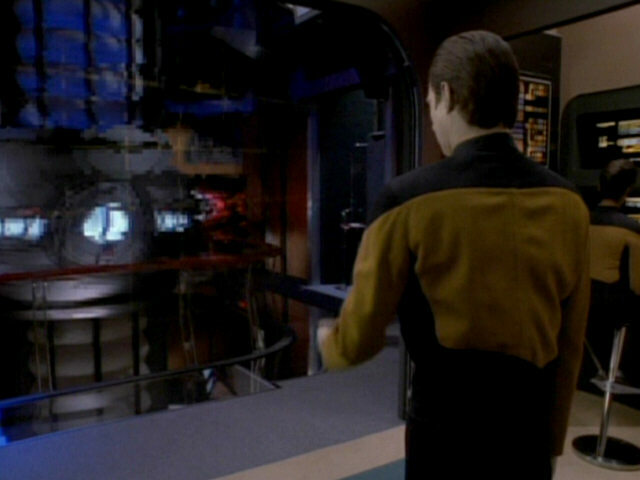 An unnamed ensign touches the forcefield erected by Moriarty in a corridor. 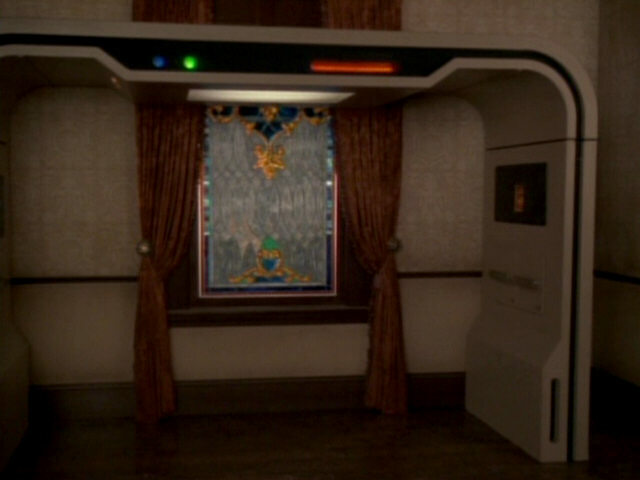 The open corridor wall panel is seen again a few episodes later in "Starship Mine". 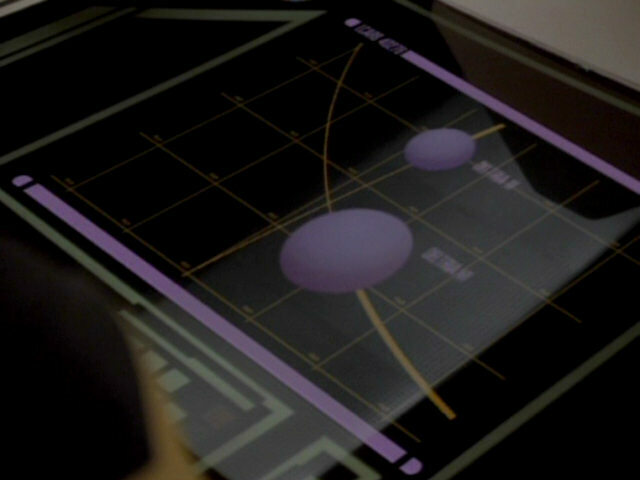 "Starship Mine" The reconstructed effect in HD. 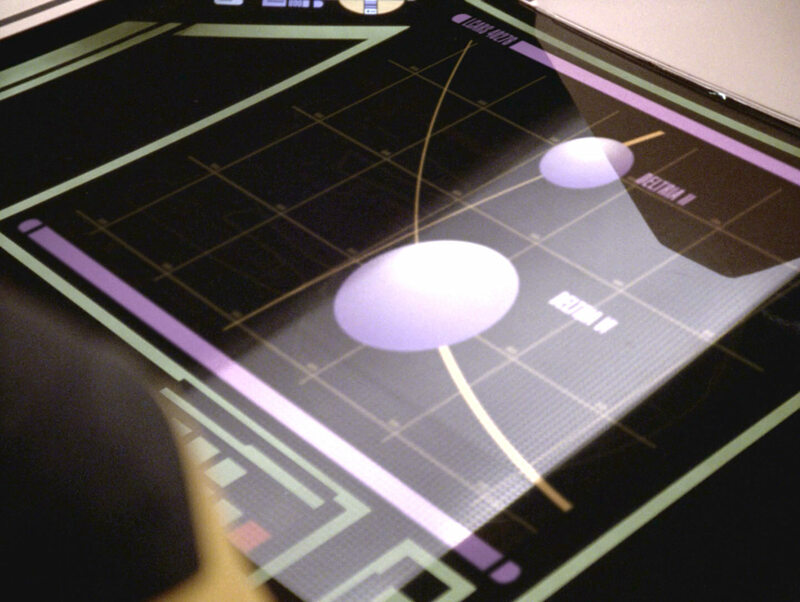 A look at the other side of the holodeck arch reveals that is also now features a much larger LCARS display and two large wall panels. 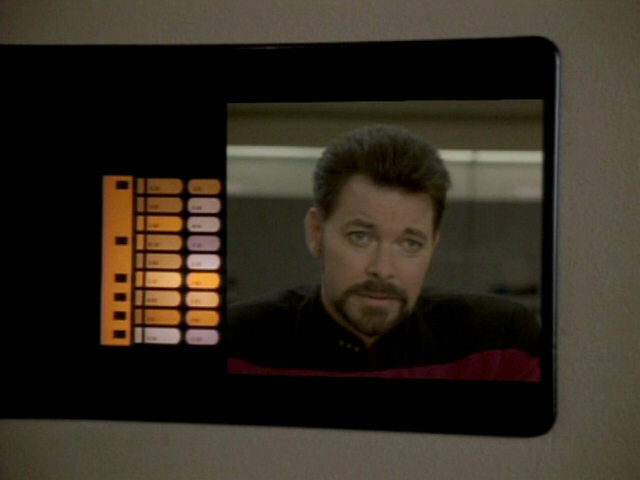 These modifications were not yet present in earlier episodes, like" Family". 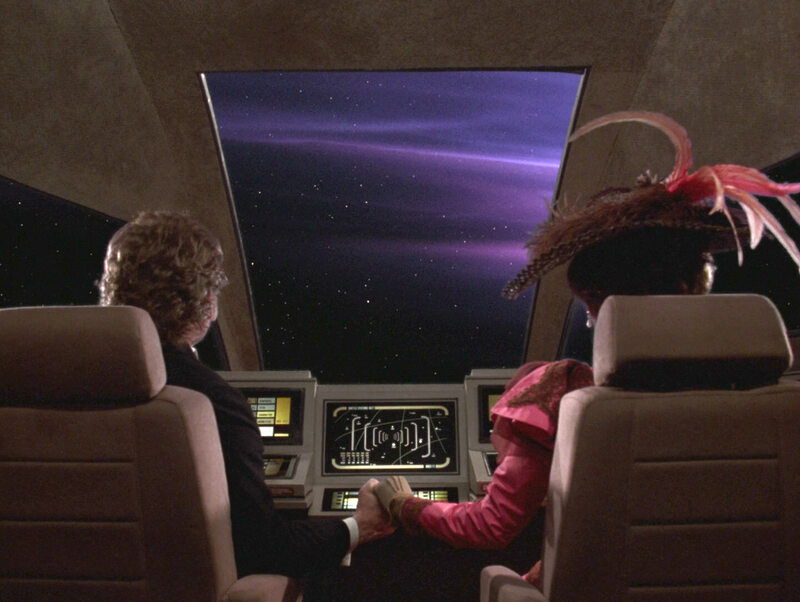 "Family" A look at the arch in HD. 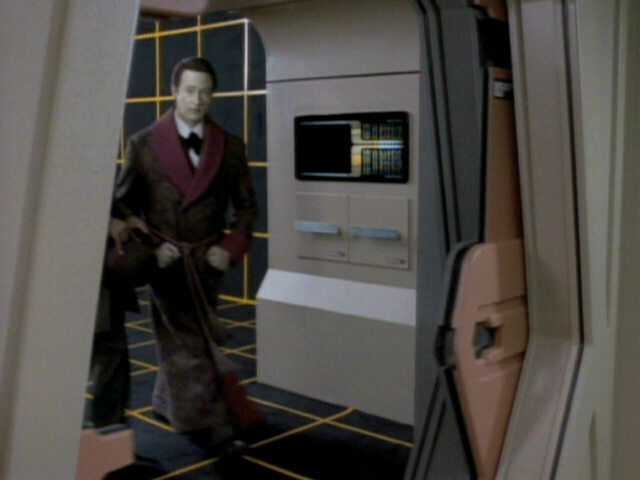 Both the exterior shuttlebay and the interior shuttle shots leave no doubt that Moriarty and Countess Bartholomew are leaving the USS Enterprise-D in a Type-6 shuttle. For one shot, however, stock footage from "Unnatural Selection" of the Sakharov, a Type-7 shuttle, is used. 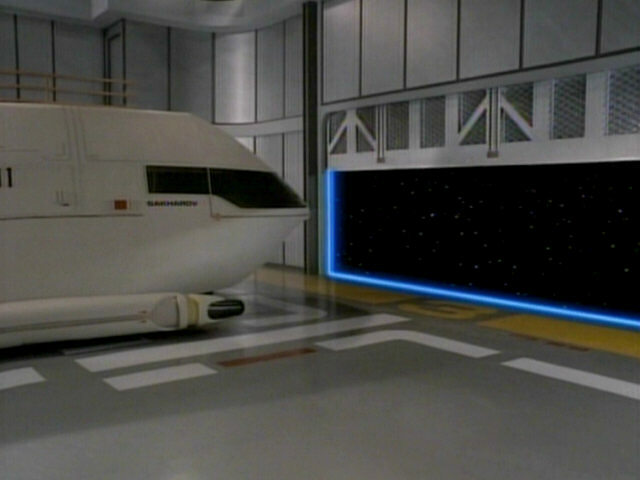 As can be seen in the screenshots from that episode, the interior of the Type-7 shuttle looks much different. 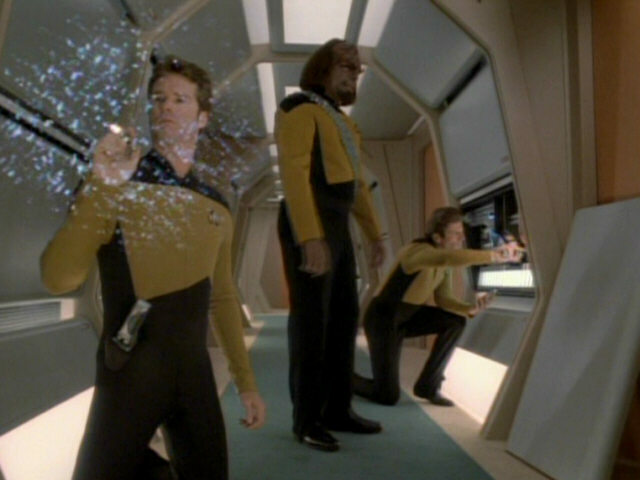 Selection" The shuttle in TNG-R. 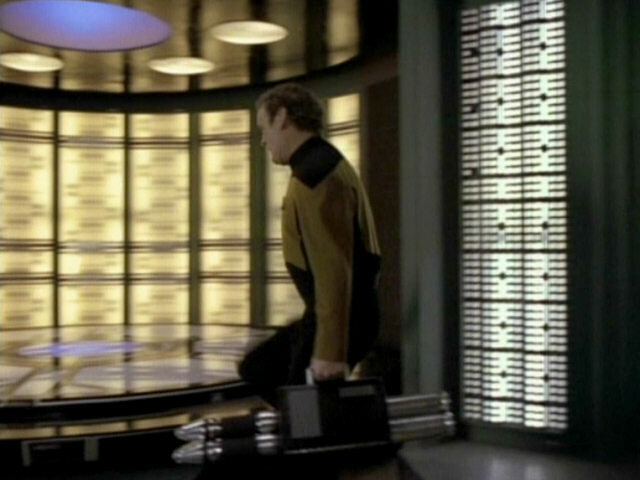 Unfortunately the wrong (and ugly) exterior shot was not fixed. 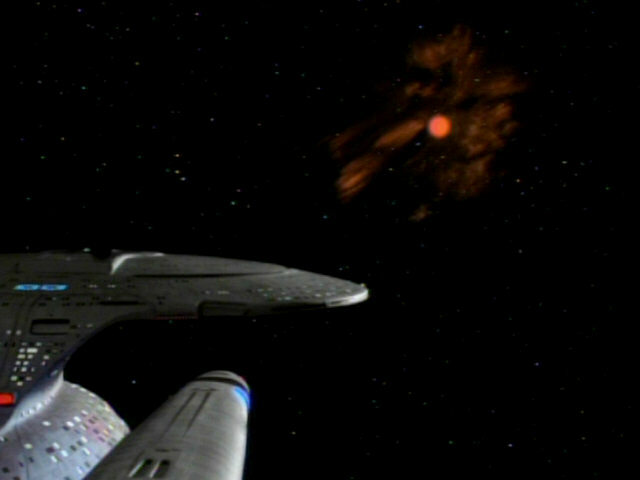 The shuttle flies off towards a nebula close to the Deltrian system. 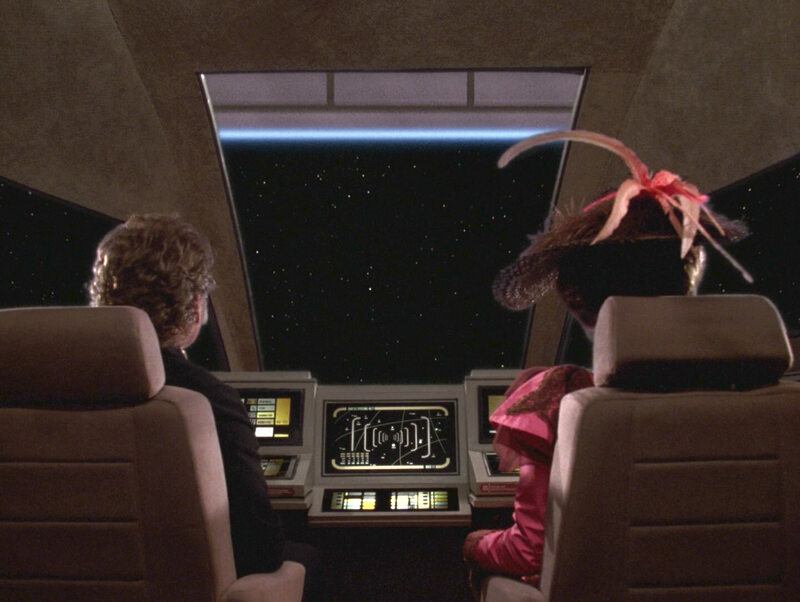 The look out of the window in HD. 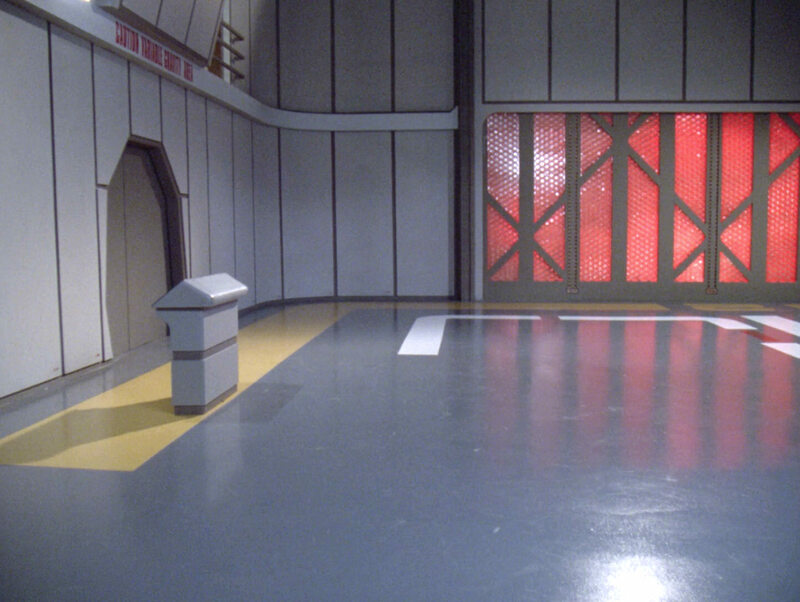 A nice shot of the empty shuttlebay. 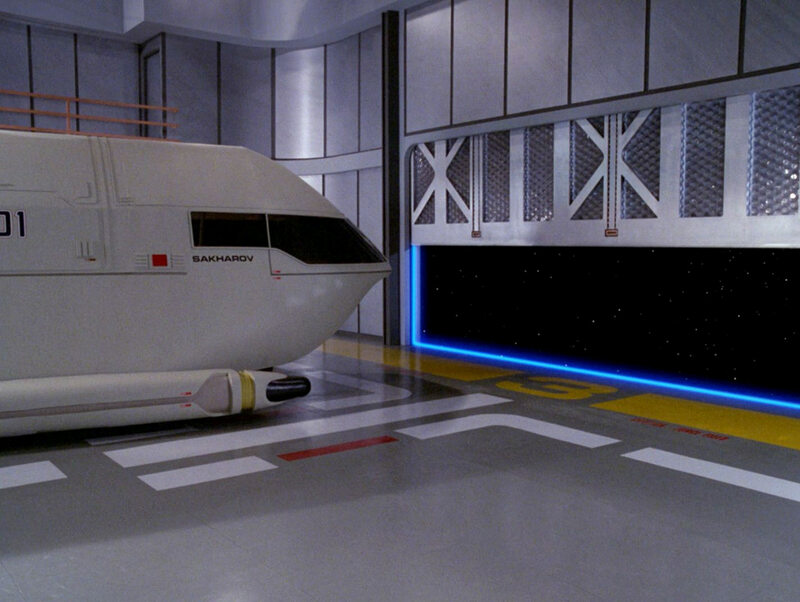 The shuttlebay in HD. 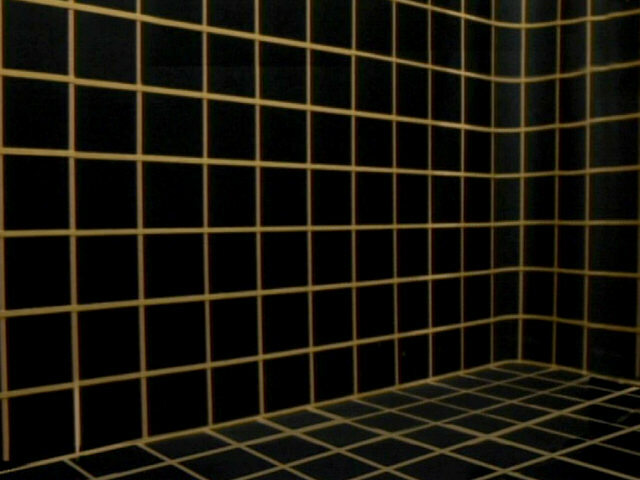 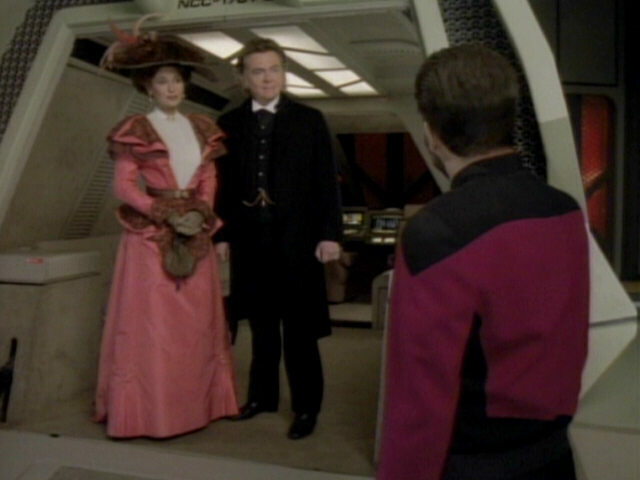 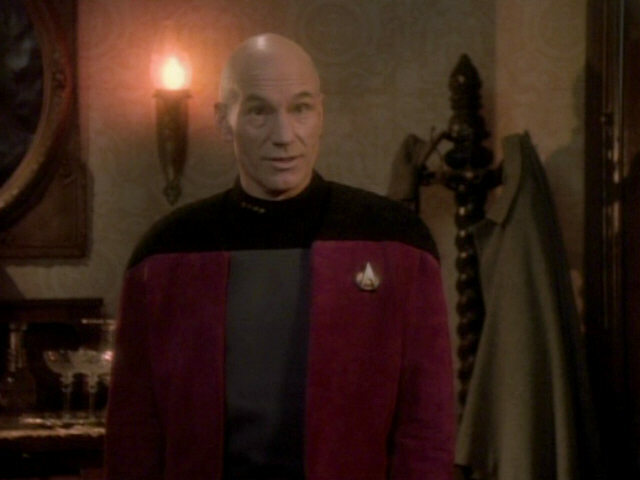 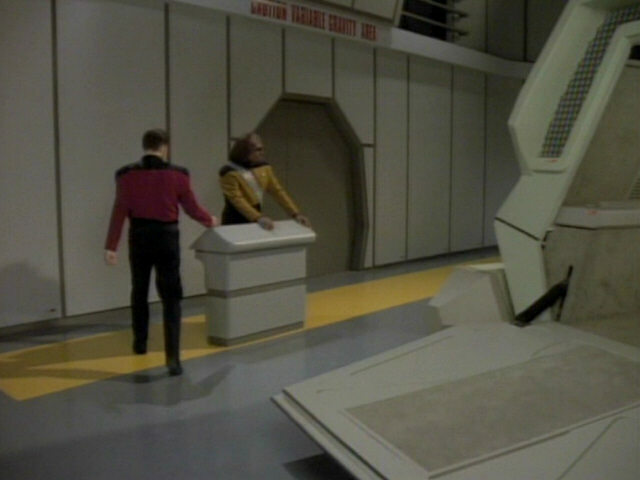 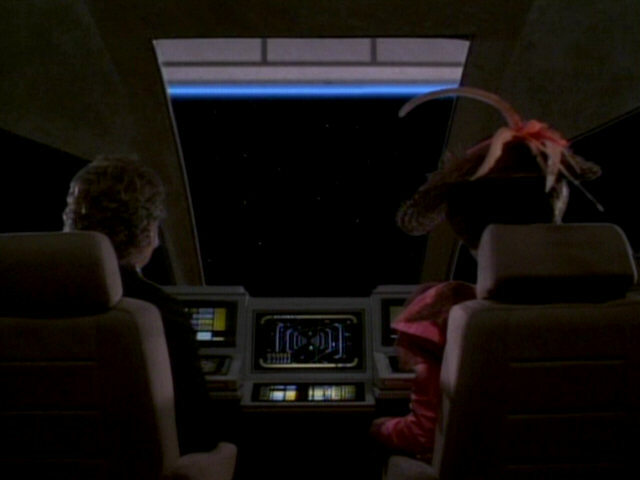 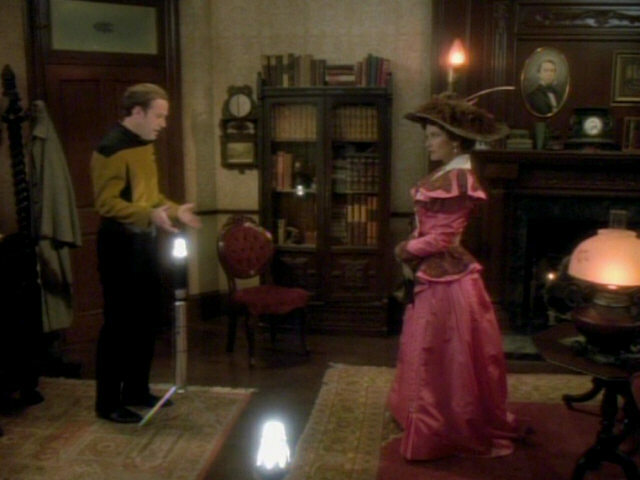 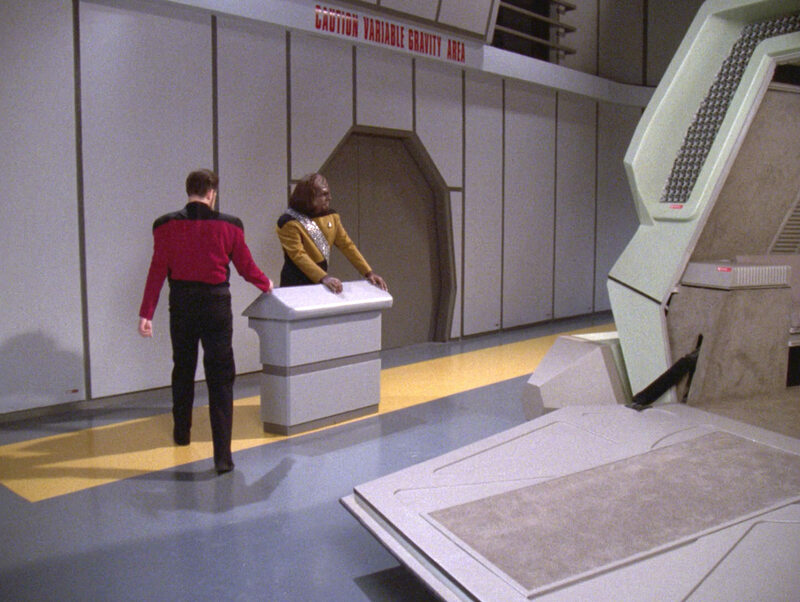 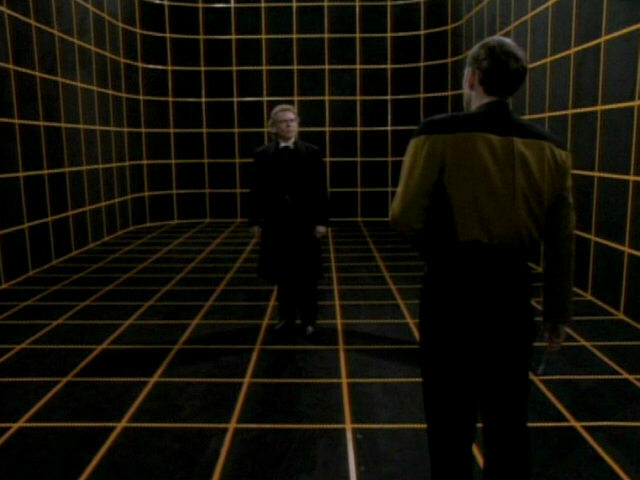 The holodeck has increased by the width of two squares since the beginning of the episode. 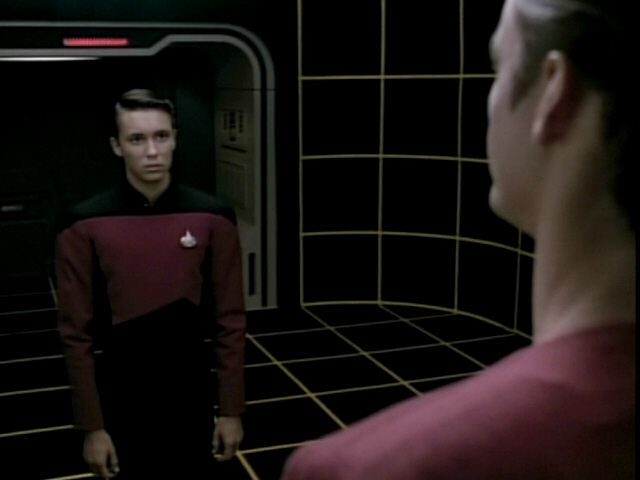 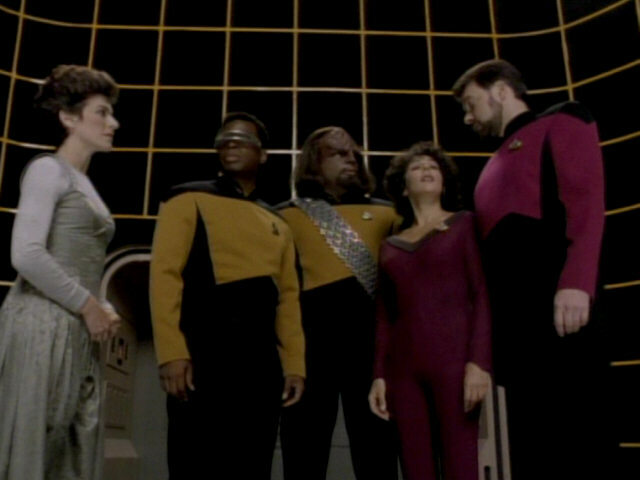 this episode The hologrid was not fixed for TNG-R. 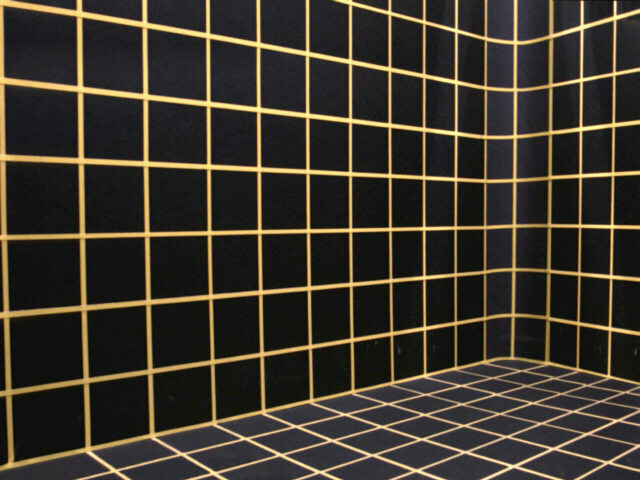 Here's what the corridor wall behind the holodeck door looks like in reality. 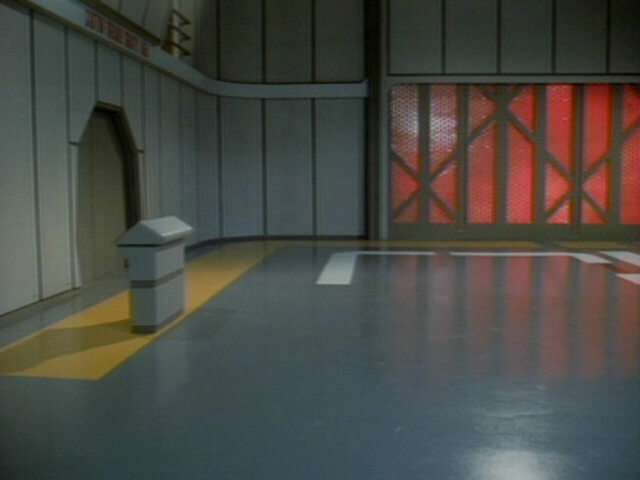 The door to the junior officers' quarters on the left is seen standing open and some filming equipment is visible. 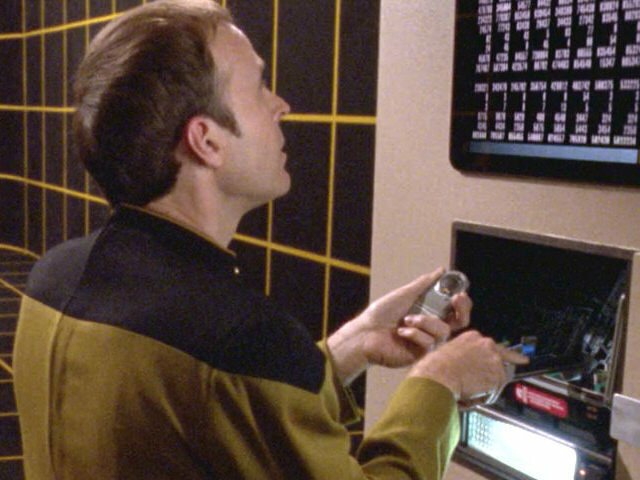 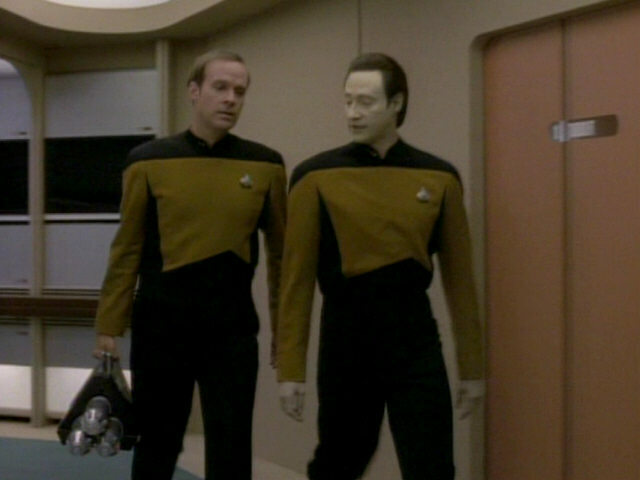 We can still see the equipment in TNG-R. 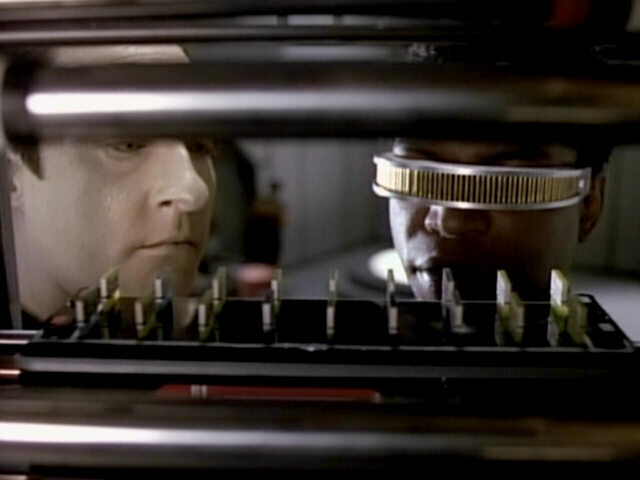 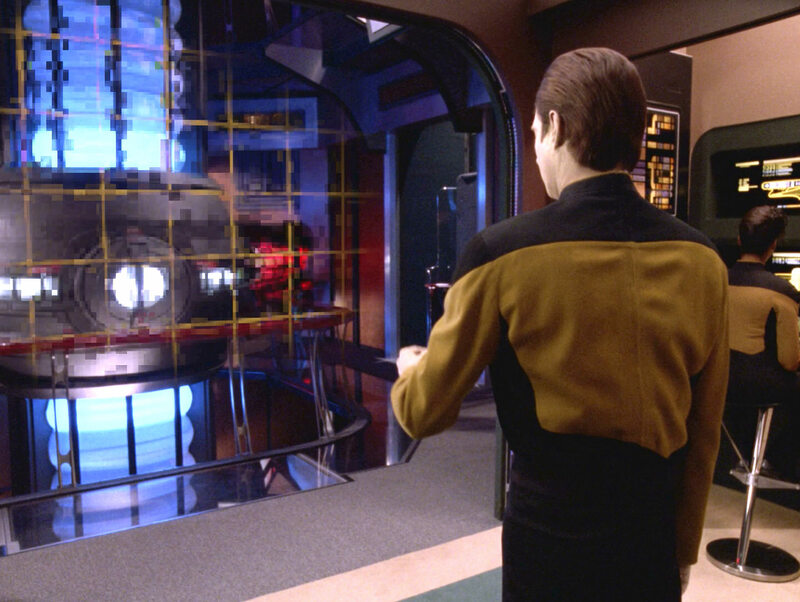 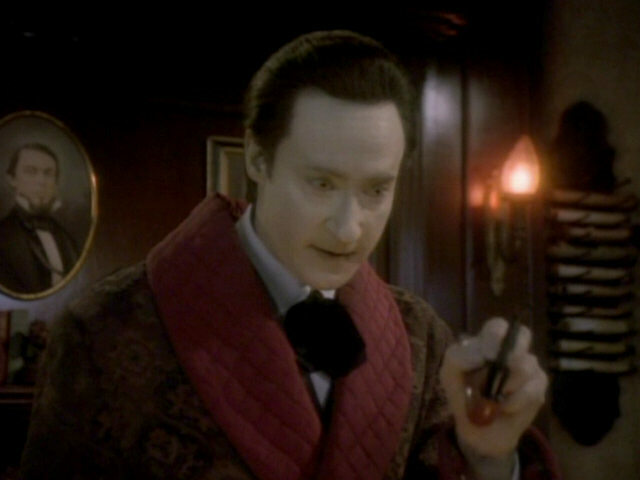 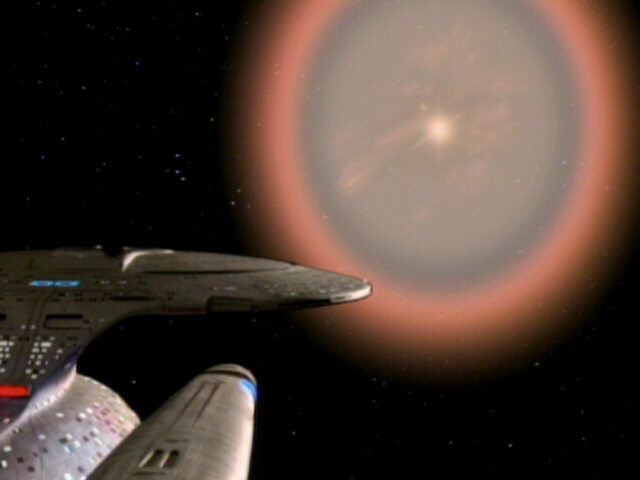 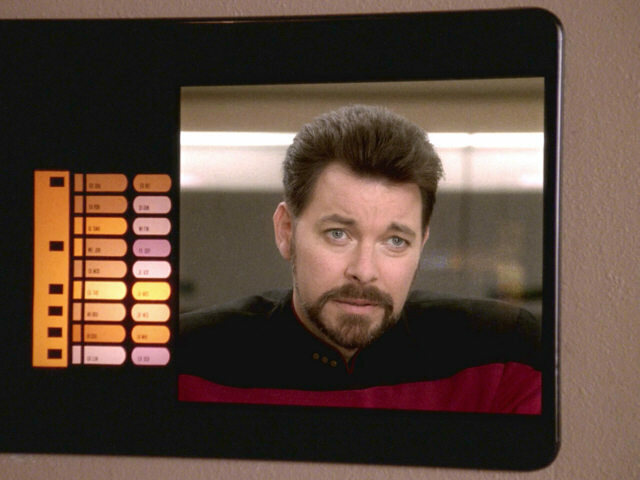 Both the tech cube and enhancement module appeared in a similar function, many years later in the Voyager episode "The Killing Game", identified as an optronic data core. 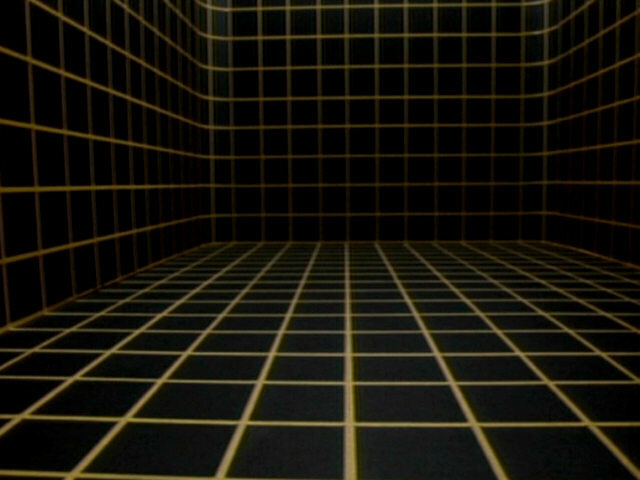 Killing Game II" The cube and the storage device in HD. 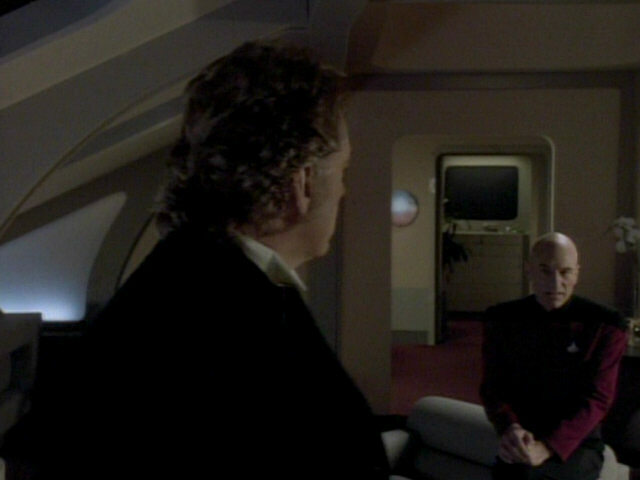 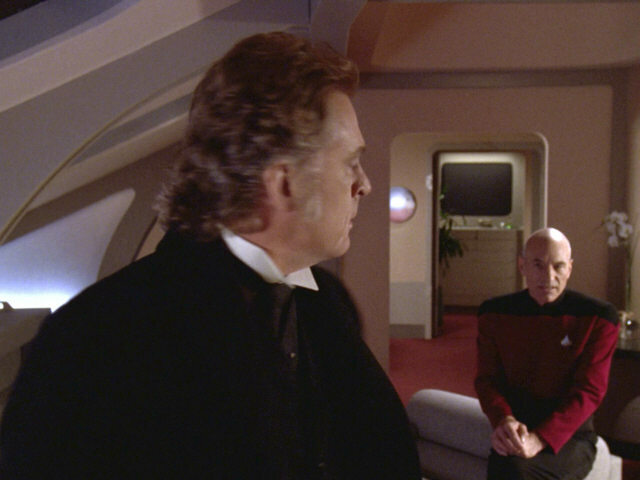 For some reason, Picard's chair is missing in this shot. 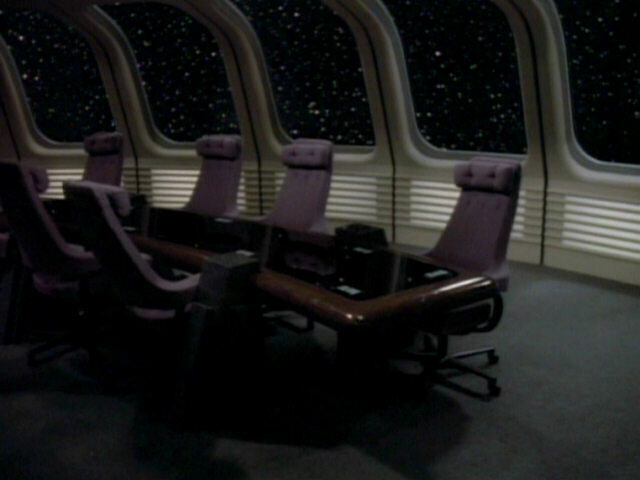 The chair was most likely removed so the senior crew could be standing closer to each other in the shot. 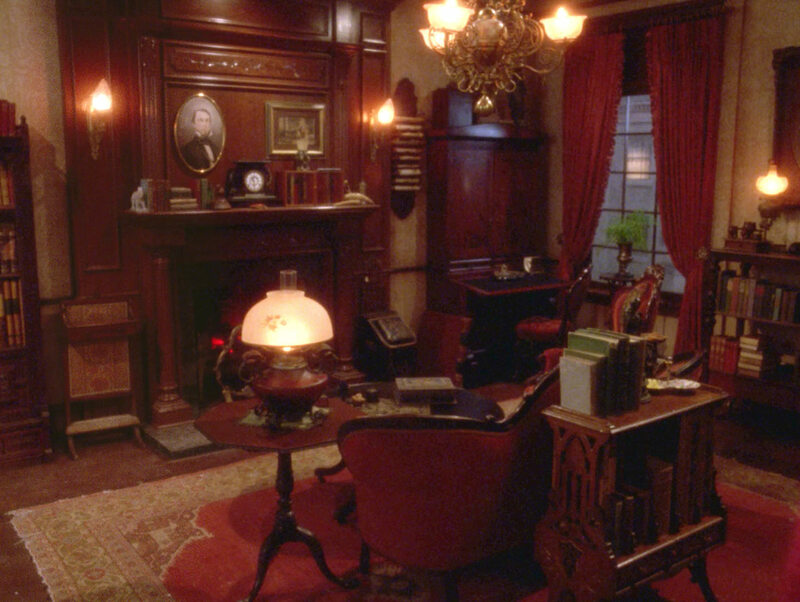 The lounge in HD. 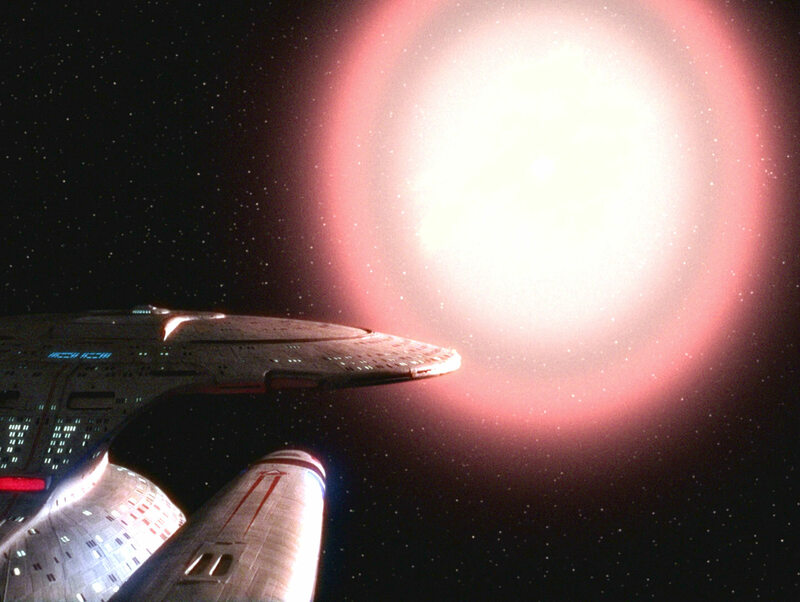 A new star is born in the Deltrian system. 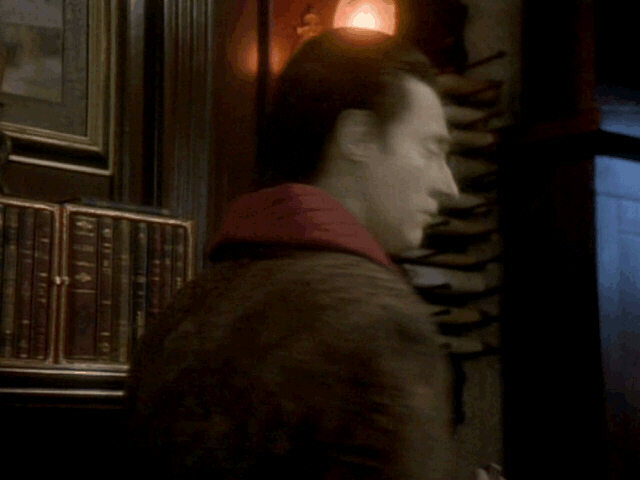 The effect sequence in HD.